A system as old, complex and eclectic as the "L" is bound to pose a few questions every now and then, even to the most experienced rider. So, below are a compilation of the most Frequently Asked Questions (also known as FAQs) about the Chicago "L" . It is by no means complete, but does contain a few common head-scratchers. Questions regarding the policies, content, and use of this web site are also answered here. Questioned are grouped by general subject, in no particular order. If you have a question you'd like answered, contact us. Feedback and additional information are also appreciated. 1.1 Is it spelled "L" or "el"? And why does Chicago call it the "L" rather than the "el", as New York City and other cities do? 1.2 What does CTA stand for? 1.3 Why is it called the "L" if it isn't always elevated? 1.4 What is the CTA's policy on photography on the system? 1.5 Sometimes the CTA says it's facing a budget shortfall or has insufficient funds, leading the agency to threaten curtailing service or raising fares and advocating for additional funding. Yet they have enough money undertake massive projects like renovating the Douglas, Dan Ryan, and Brown lines. Why don't they just use the money from these improvement and expansion projects to keep transit services funded and hold the line on fares instead? 1.6 Why does CTA prohibit eating on "L" cars but have concessions in stations that sell food? 2.1 Why are there so many different station signs? Why are they all different colors, types, etc? 2.2 How many "L" stations are there? What is the most there's ever been? 2.3 What's the deal with the Wilson station? Why is the east platform abandoned? What happened to its canopy? What happened to the Wilson Shops? What's the origin of the spur track to the west? Was the platform there ever used? Where does it go south of Wilson? 2.4 What's the history of the Part-Time stations? When did it happen, and which stations were originally made part-time? Are any of them going to be made full time again? 2.5 Is the CTA going to ever make better use of the LED displays on the platforms? 2.6 Why don't you have a profile page or pictures of (insert station name here) in the Stations section? I really like that station and think it deserves to be in there! 2.7 I've always wondered about having to go all the way to 51st to transfer between the Englewood and Jackson Park branches. (58th was an A station and Garfield was a B station.) Wouldn't it have made more sense to allow people to transfer at 58th, with its closer location and easily-crossable island platform? 2.8 At most stations, a portion of the platform has a yellow stripe painted along edge, usually toward the middle and about 10 feet long. It can't be a warning line to keep back from the edge, since it doesn't run the length of the platform. What does this line mean? 2.9 Why aren't there public restrooms in "L" stations? 2.10 On some platforms, I see signs that read "Rush Hour Stop" on poles, some of the the light posts, canopies, etc. when the stations are open and trains stop at these stations even when it's not rush hour. What's the deal with these signs and where did they come from? 3.1 Why doesn't the third rail short out when it gets wet or rained on? 3.2 What is the story behind the abandonment of two of the four tracks on the Ravenswood between Armitage and Chicago? Why is it only two tracks between Chicago and Tower 18? 3.3 What are those stingers used for that you see along the CTA tracks? I assume they do something along with the third rail, but what do they do exactly? 3.4 I wanted to know about the smaller gauge tracks that are inside the regular tracks on some portions of the "L". 3.5 I've noticed some abandoned "L" tracks along Paulina between Lake and Harrison. Were these one part of the Blue Line? Why were they never torn down? Do they someday plan to return this part of the system to use? If I am correct, wasn't there a Madison Street stop right there by the United Center? Why did they discontinue service on these tracks in the first place? 3.6 Can you tell me what the deal is with the heat lamps at the portals of the subway tunnels? They seem to be on at all times of the year, and the train seems to zoom past it too quickly to be of any real use. 3.7 Were there ever any plans to demolish the Chicago 'L' system and replace it with subways, as has been done in New York and Boston? 3.8 The Congress (Forest Park) branch right-of-way is a lot wider than it needs to be. What is the extra space for? 3.9 When the Blue Line emerges from the Milwaukee-Dearborn Subway east of UIC-Halsted station, there are two extra portals to the north of the two the Blue Line uses. What are these two unused subway portals for? Have they ever been used? 3.11 Most of the "L" structures in the city are comprised of steel girders. However, the structure between Lawrence and Howard on the Red Line and up past Central Street on the Purple Line is built on a solid right-of-way above grade, similar to the paralleling Metra/Union Pacific right-of-way. How were these above-grade structures built? When was the above-grade right-of-way built and why wasn't a standard steel elevated structure used? 3.12 I've noticed that the elevation of the tracks on a stretch on the Green Line around the Illinois Institute of Technology goes up and down like a roller coaster. Someone once said this was to facilitate gaining and reducing speed when entering and leaving stations. Is his explanation correct? If so, why wasn't the principle used elsewhere on the system? 3.13 Today, the Loop -- as in Chicago's downtown district -- is synonymous with the "L"'s Loop Elevated. But some have suggested that this name for Chicago's downtown originated not with the elevated line but with a streetcar loop that encircled downtown years before the "L" opened? So, which is truly the origin of the nickname? 3.14 Why do the trains always go so slow down between [location] and [location]? 3.15 What are the WA Zone signs/WA Control boxes along the right-of-way? What is a WA Zone? What does "WA" stand for? 4.1 Why were the 4000-series cars incompatible with all the latter series cars? Why did the CTA make the same "mistake" again by making the 6000s incompatible with later cars? 4.2 Above you said the 4000s didn't have remote door control and a few other features, but I remember seeing them with these features. 4.3 When were the last of the wooden cars retired? 4.4 I've noticed a two car unit numbered 3457-3458. I thought only 256 3200-series cars were ordered -- not 258. Also, 3458's sides were not corrugated like the rest of the 3200s. What is with these two cars? 4.5 When is the 2600 rehab contract finishing? 4.6 Why do "L" cars have only two doors per side? I look at many different railcars in America like New York, Philadelphia, Los Angeles, Boston... and most of them have three or sometimes four doors per side on their railcars. How come CTA railcars only have two? 4.7 Are the CTA railcars shorter than that of the NYCTA (New York City Transit Authority) or other cities? To me they look a lot shorter in length. 4.8 I've noticed there are light, usually in sets of three, next to every door on each car. The color and amount of lights next to particular doors varies depending on the series of train series. What's the deal with these lights? What exactly do they all mean? What are the different colors? Why are there different configurations of these lights between the older and newer train sets? 4.9 Why does Chicago use the "theater row" seating in their cars -- that is, an aisle with rows of transverse seats on either side of the aisle. It seems a clumsy and inefficient use of space, it makes it difficult for people to move about the car during rush hour. Why not have seating against the walls of the cars and more standing room in the center of the cars as in the New York, DC and London subway systems? 4.10 What is the current status of the 3500-series car project? When are the 3500s being delivered? Will they merely supplement the fleet or are the 2200s going to be decommissioned? 4.11 What is the current status of the AC-propulsion car project? When are these cars being delivered? 4.12 Why are there extra destination signs on the train roller curtains -- i.e. "Roosevelt" and "Wilson" for the Red Line, "Rosemont" for the Blue Line, etc. -- that are not needed for everyday service? What are these readings for? 4.13 What is the purpose of the wooden board to the right of the #2 end doors inside "L" cars? 5.1 What is the "A/B skip stop" system? 5.2 I remember the "L" having conductors. What happened to them? 5.3 Was Chicago's elevated system ever used for any kind of freight service? 5.7 When a train takes the wrong route at a junction, how does that happen? Isn't the route preprogrammed or does the operator choose his/her route themselves? 5.8 Why is it that sometimes when a train pulls in to a station, it will stop before it is fully into the station, then start up again and complete its arrival into the station? It always confuses passengers as people run to where it stopped short, only to have it move again. 5.9 Did the "L" have 24-hour service when it first opened? When did various lines lose overnight "owl" service? 6.1 Did the Kenwood and Stockyards branches run over streets or alleys and are there any remnants left? 6.2 I've noticed that in the Dearborn Subway of the Blue Line, there appears to be a short spur, apparently heading to the west, between the Grand/Milwaukee and Clark/Lake stops. What this might be for? 7.1 Is the restoration of the two unused tracks on the Brown Line between Armitage and Chicago part of the proposed $300 million Ravenswood renovation in the Illinois FIRST bill? 8.1 When did Chicago-L.org start? 8.2 Why was Chicago-L.org started? 1.1 Q: Is it spelled "L" or "el"? And why does Chicago call it the "L" rather than the "el", as New York City and other cities do? A: Whether the Chicago rapid transit system is officially referred to as the "L" or the "el" seems to be a matter of opinion, but the most commonly accepted version is "L" . This spelling is what the Chicago Transit Authority uses and what the private "L" companies used from the first day of operation. The key thing to realize is that it is a shortened version of "elevated railroad". Other cities have (or have had) elevated rapid transit systems and they too have used this shortened nickname. However, in other cities (New York City, for instance), it is used as a generic name, so "el" is usually utilized there. In Chicago, however, it specifically refers to a particular system and the more unique and specific "L" is used. But, still, they are sometimes used somewhat interchangeably, especially by the press and public. But, the fact that CTA publicity and literature uses it and the previous companies (mostly the CRT) have also used "L" for their maps, ads and publications would seem to back-up the use of "L" , and not "el", for the Chicago system. It has never really been completely clear why Chicago calls it 'the "L" ' rather than 'the el", although it was mostly likely 1) a marketing tool or gimmick; and/or 2) may have also been a way to differentiate Chicago from NYC (as the Second City is often wont to do). The identity of the person who coined it has been lost to history. However, what is known is that the use of the term "L" pre-dates the opening of the first line in 1892 and was quickly adopted by the press and public. It could be seen on printed materials and painted on the elevated structure at stations by 1893, the year after the first line opened. So it has been with us from the beginning of the system. Later, in the 1910s and 1920s, the "L" companies began using it even more prominently on marketing materials, with the invention of a stylized "L" in single quotes (which the CTA briefly brought back for a few year on the rail system maps above the doors on the railcars; it's since been superseded by the new "dot" CTA logo; however, around 2009 the CTA added 'L' in Helvetica type to its rail system car card maps and map posters in rail stations and at bus stops with Decaux shelters). The CTA seemingly brought the matter to some conclusion on February 9, 2012, when it posted this message to its official Twitter feed in response to a survey by GridChicago about what the proper spelling is: "'L' is correct use, dates back >120 yrs in Chgo; "el" is generic abbrev. for 'elevated,' 'L' applies to whole system. #settled". Indeed. 1.2 Q: What does CTA stand for? 1.3 Q: Why is it called the "L" TM if it isn't always elevated? A: The thing to remember here is that Chicago's non-elevated sections are relatively new. Unlike cities like New York, Chicago didn't get its first subway until 1943. Up until this time, most of the system was elevated (with the exception of a few short sections in outlying suburbs, but even these were mostly elevated by the 1920s). So, by the time the State Street subway opened, the name "L" (short for "elevated railroad") had already been in popular use and thus stuck. 1.4 Q: What is the CTA's policy on photography on the system? A: This is by far the most common question we get, so we're happy to bring you some information on the CTA photography policy. According to the CTA Communications Department, they don't allow photography except for personal photos or the "occasional tourist shots". Photography is permitted as long as it is for personal, nonprofit, noncommercial use. All other photography -- news media, commercial, etc. -- requires approval and a permit from the CTA Communications Department. Generally, this permit requires proof of insurance and a Right of Entry fee (the fee is often waived for students, nonprofit publications, tourist publications, etc.). News media can only shoot, tape or film with prior approval of Media Relations. Personal photography, which most tourist and railfan photos fall under, is permitted by the CTA . According to CTA Rail Service Bulletin R146-03, "personal photographers are permitted on CTA property if their activity is incidental, does not pose a distraction to others and does not affect any customer or employee's safety. Individuals in this category may be identified by the use of simple cameras. Personal photographers generally spend little time in one location and take pictures while waiting for a train." Please also realize that, as a result of the current state of security in major American cities (as this is being written in March 2003) as well as the national security alert level, police and transit personnel may be more or less concerned about photography at different times. Please be patient and understanding in these matters. Note: These rules pertain ONLY to individual railfans taking photos with handheld cameras. These rules DO NOT apply to professional, commercial or media photography or filming. For information on this, please contact the Chicago Transit Authority Communications Department. Also, try to avoid taking pictures of employees, agent's booths, etc. without permission from the people in the picture. Chicago-L.org and its contributors are not responsible for the consequences of not following the rules. Chicago-L.org is not responsible if the rules change without notice. Chicago-L.org is also not responsible if the Chicago Transit Authority, Chicago Police Department, or other personnel enforce a no-photography rule in error. 1.5 Q: Sometimes the CTA says it's facing a budget shortfall or has insufficient funds, leading the agency to threaten curtailing service or raising fares and advocating for additional funding. Yet they have enough money undertake massive projects like renovating the Douglas, Dan Ryan, and Brown lines. Why don't they just use the money from these improvement and expansion projects to keep transit services funded and hold the line on fares instead? A: The issue here is that capital improvements and daily operations are funded from different sets of money. Understandably, this a budgetary distinction that the average rider may not appreciate and can create a false sense of misplaced priorities or poor budget allocation at the Authority. But this is not, in fact, what's at issue here. general administration (includes transit service development, injuries and damages, safety, personnel administration, legal services, insurance, data processing, finance and accounting, purchasing and stores, engineering, real estate management, office management and services, customer services, promotion, market research and planning). Capital funds are generally those funds that are reserved for expansion, improvement, and upgrading of the system. Capital funds may be used for expenses related to the purchase of equipment; infrastructure such as rights-of-way; stations and associated facilities; overhaul and storage facilities and the equipment therein; passenger rolling stock and other service, supervisory or other ancillary vehicles; certain other equipment such as fare collection equipment, shelters, signs, and passenger amenities; and some equipment used for administrative and customer service functions. Some of the uses listed for capital funds are also listed in the operating categories above. Indeed, certain improvements, equipment purchases, and personnel costs may be funded out of either operating or capital funds, depending on, in the case of capital funds provided by the government, how the grant is written. But capital funds cannot be used to fund transit operations or operating personnel costs. So, where does CTA get these separate capital and operating funds from? The CTA's charter from the Illinois state legislature requires that at least half of its operating budget come from the farebox (generally meaning money collected from fares). For more than the first 20 years of the Authority's existence, farebox revenues were enough to cover operating costs. But by 1970 the CTA , like most transit systems, was subject to forces beyond its control -- inflation, the out-migration of residents to suburbia, increased auto ownership and use -- resulting in revenues no longer covering operating costs. It was in this era that the government began regularly assisting transit agencies with subsidies. In 1970, the transit lobby finally persuaded Congress to pass the Urban Mass Transit Act, which committed the federal government to $3.1 billion in capital grants over a three-year period. And in 1974, operating subsidies were obtained with the passage of the National Mass Transit Assistance Act. These subsidies, however, were intended to cover "new" deficits from system expansions, not from existing services. Around the same time, in 1973, the Regional Transportation Authority was created to provide budgetary oversight over Chicago area transit. The RTA was given the power to tax and use these funds to subsidize transit operations. The RTA originally had a gas tax and a parking tax, as well as a straight operating subsidy (3/32 of the state sales tax from the Chicago area) but this provided to be insufficient. In 1983, the state legislature replaced these with just a sales tax, 1% in the City and Cook County and .25% in the collar counties (a compromise resulting from the suburbs refusal to cross-subsidize the CTA ). The state also provides a 25% match to the regional sales tax that goes directly to the RTA (as opposed to being programmed to go directly to one of the service boards), who divides it up between itself and discretionary funds to each of the service boards. The operating subsidies from the federal government were always somewhat modest, considered a supplement to local funding and farebox revenue. Capital funding, however, was largely taken up by state and federal government, mostly by the latter. By 1980, federal subsidies accounted for 80% of the capital expenditures for CTA and suburban transit, with state government providing most of the remaining 20%. Meanwhile, the level of operating subsidy began declining soon after its inception, steadily dwindling over a period of 25 years. In 1979, the Chicago region received about $80 million in operating fund subsidies (~$200 million in 2003 dollars), while in 1985 CTA got over $50 million (~$90 million in 2003 dollars). Around 1994 the operating finding levels took a nose-dive, with the federal government ceasing to provide operating funds in 1998, leaving those subsides, if provided, to state and local governments. The federal government was not shirking its duty to provide transit subsidies per se, but had made a conscious decision in the 1990s to pool all of its subsidies into capital grants. The bulk was for New Start Programs, designed to provide cities with no or poor mass transit with the funds to build new system infrastructure. Indeed, the CTA has been one of the beneficiaries of this decision, obtaining funds to renovate the Douglas, Ravenswood, and Dan Ryan lines, as well as other projects, under this capital assistance program. But, paradoxically, this has the possibility of creating a scenario in which systems have new, modern infrastructure but lack the funds to operate a satisfactory level of service on it, let alone a service of such quality and frequency to lure significant numbers of people from their cars. 1.6 Q: Why does CTA prohibit eating on "L" cars but have concessions in stations that sell food? A: In Fall 2005, there were 71 concession stands at 63 rail stations, according to the CTA . Eight of those stations had two concession stands. "We want you to enjoy your cup of coffee on the train platform or while waiting for your bus (or after you leave the train or bus), but food-related spills and trash create a mess that makes the ride unpleasant for other customers. And it also costs the CTA money. For example, each year the CTA spends about $2,800 per rail car to clean up trash (food wrappers, newspapers, coffee spills, etc. Note: coffee with cream and sugar is one of the most costly spills to clean-up). That's between 5 and 10 cents of every full $1.75 fare. Holding these costs down helps us keep fares lower and increase service. "We're also trying to increase revenue for CTA, which is why you see more concessions on CTA property. The CTA receives about $1 million annually from these concessions, and we are working to increase that amount. I also think customers welcome the convenience of amenities to their daily commute." Chairwoman Brown also noted that concessions help increase revenue for CTA , which helps the agency balance its budget. The CTA receives about $1 million annually from these concessions (circa 2005). 2.1 Q: Why are there so many different station signs? Why are they all different colors, types, etc? A: There are a number of reasons. First, the reason there are two basic types is that the CTA is currently in the middle of a program to replace and update the stations' signage, so some of the new ones are up while most still have the old type. The new signs have a gray background with white Helvetica letters. The old ones have a colored background (red, green or blue, depending on the stations type; see previous question for more on this) and white Helvetica letters. The fact that the latter has three different colored backgrounds adds to the appearance of extreme inconsistency to those not familiar with the old signage system. Someday, they should all be consistent again. Two really old examples of "L" signage also remain: a CRT-era blue and white enamel sign remains at Sheridan and a 1950s-era CTA sign remains Medical Center. For more on signage types, see the Platform Signage section. 2.2 Q: How many "L" TM stations are there? What is the most there's ever been? A: Currently, there are 144 operating CTA stations, following the opening of Conservatory in 2001, and 6 abandoned ones. The most stations there have ever been on the "L" system at one time is 227. This number was achieved in 1943 with the opening of the State Street Street subway and remained in effect until 1948 when the Skokie branch (March) and 10 Lake Street "L" stations (April) were closed. After this, an additional 23 North-South stations were closed (1949), followed by the Westchester (1951), Humboldt Park (1952), Normal Park (1954), Stock Yards and Kenwood (1957) Branches, beginning a long period of station closings. 2.3 Q: What's the deal with the Wilson station? Why is the east platform abandoned? What happened to its canopy? What happened to the Wilson Shops? What's the origin of the spur track to the west? Was the platform there ever used? Where does it go south of Wilson? A: I get more questions about this station than any other, so I updated the Wilson profile page to answer most of these inquiries. Click here to see it. 2.4 Q: Are they going to make Harrison/State (or substitute one of any number of other station names here) a full-time station again? I don't even see the point of part-time stations nowadays, since they have to be staffed [for security purposes] even when they're closed. They do speed up travel a little bit, but not by much. What's the history of making subway and elevated subway stations part-time? When did it happen, and which stations were originally made part-time? On Wednesday May 3, 2000, the Chicago Transit Board, citing increasing ridership, approved the extension of the operating hours of six rail stations and eight station entrances. The following stations which were Part-Time (closed on Sundays and holidays) will now be open whenever trains are running (all but Owl hours): Madison/Wabash, Washington/Wells and LaSalle/Van Buren. The following Part-Time stations will now remain open 24 hours a day: Chicago/Milwaukee, LaSalle/Congress, and Harrison/State. This leaves no Part-Time stations left on the system. The changes took effect in Summer 2000. 2.5 Q: Are they going to ever make better use of the LED displays on the platforms (like something that tells you how long until the next train arrives, the current time and temperature, etc.?)? A: The original plan behind the LED signs on the platforms was threefold: 1) have a method to display "canned" messages (about smoking prohibition, special service for events, etc. ); 2) display messages sent from the Control Center in the case of an emergency or service disruption; and 3) alert riders to approaching trains. Since being installed, all of the LED sign can display the canned messages. And they have also been used for special messages during unusual situations. The one function that has been unevenly implemented has been the "next train" function. Most of the Green Line has the this function activated, as does the Orange Line. Elsewhere, only a few stations have it. This function plays a canned message -- usually "Attention customers: An inbound train, toward the Loop [or outbound train, from the Loop], will be arriving shortly," or some derivation thereof -- over the PA system when a train is about a minute or so away, while the same is displayed on the LED signs. The announcement is triggered by the train hitting a trip at the previous station. The reason for having both the voice and the LED is ADA compliance. As an aside, some stations do not have LED displays at all: stations that are programmed for reconstruction -- Brown Line stations, for instance -- did not have the panels installed in the 1990s. Some older stations still lack LED signs. Since the 1990s, various pilots and projects have sought to bring real-time countdowns for train arrival and departure information to the LED signs. The RTA launched a pilot project in 2002 called the Active Transit Station Signs (ATSS) project. ATSS signs provide real-time transit and traffic information on a demonstration basis. There were four project test sites in the pilot: Midway, O'Hare, Davis, and Cumberland. The ATSS signs, which were a type of LED sign, displayed a countdown of the minutes until the next departing or arriving train, as well as other canned messages. If they were successful, the plan was for them to perhaps supersede the LED displays for communicating train arrival information. However, the ATSS signs did not progress beyond the pilot phase. Beginning in January 2009, LCD digital screens began to be installed by Titan Outdoor, CTA's advertising vendor. Seventeen "L" stations have the Titan LCD displays, of which six displayed estimated train arrival times until June 2009. CTA discontinued that pilot due to technical issues that resulted in a delay of up to a few minutes before the information was displayed on the screens, making the countdowns unreliable. A new pilot began in spring 2010, when testing began at 10 stations, including Chicago (Brown Line), Fullerton, Polk, Ashland and Clinton (Green/Pink lines), UIC-Halsted, Cermak-Chinatown, and Lake and Jackson (Red Line). Belmont (Red and Brown lines) was added to group later as well. The stations being tested include a variety of station types (subway and elevated, side and island platforms) and are geographically scattered, though all within a couple miles of downtown Chicago. The stations also feature a variety of LED sign types and vintages. The train arrival times at the pilot stations are alternated with the current date and time and, when provided, service alerts or informational messages. The arrival information for each train is shown on one line consisting of the line name, destination, and minutes until arrival, parts of which are abbreviated to fit the character limit of each line. Most stations' LED signs show only one line of text at a time, while the signs at Chicago Brown Line show two lines of text. (Only three other stations - Armitage, Sedgwick and Howard - have these types of LED signs.) The LED signs at Fullerton and Belmont are larger, able to display four or more lines of text, and thus can display more arrivals at one time. CTA is testing, adjusting, and evaluating the accuracy and communication style of the train arrival information at the pilot stations. Upon satisfactory completion of the initial pilot, CTA will look to provide the arrival information at more stations on the system. CTA still plans to display train arrival information on the Titan LCD displays as well, but decided to concurrently pursue adding the information to the LED displays, which are at the majority of "L" stations and which CTA solely controls, while the technical issues with displaying the arrival times on the Titan screens is worked out. 2.6 Q: Why don't you have a profile page or pictures of (insert station name here) in the Stations section? I really like that station and think it deserves to be in there! When the site first started, it mainly consisted of the station profiles. There was a lot of emphasis then on adding new profiles, no matter how little information and how few pictures I had available at the time. Over time, as the site grew, the Stations section became just one of many parts of the site and its emphasis declined somewhat (though it remains one of Chicago "L".org's largest sections and an important one). However, in 2007, pages were added for all remaining stations so that all stations, past and present, would be represented. Many of these are "placeholder" pages with minimal information, but can be expanded in the future as resources permit. 2.7 Q: I've always wondered about having to go all the way to 51st to transfer between the Englewood and Jackson Park branches. (58th was an A station and Garfield was a B station.) Wouldn't it have made more sense to allow people to transfer at 58th, with its closer location and easily-crossable island platform? A: This is actually a fairly common question and one that makes a lot of sense. But, the answer lies in two things: the basis on which stations were made A, B, or AB stations and the riding pattern of Englewood and Jackson Park riders. According to former-CTA executive director and transit historian George Krambles, the station designations were based on the number of passengers using each station. The A stations and the B stations were those having roughly half as many passengers as the all-stop (later called AB) stations. George said that during the planning stages, some of the officials within CTA brought up the 58th Street transfer issue. But the numbers showed that very few passengers actually chose to transfer between the two branches before 1949 (when A/B service was inaugurated on the North-South Route), despite the apparent convenience of doing so across the island platform at 58th. Evidently, most riders already preferred a one-seat ride on the 63rd Street streetcar (and later bus) for the relatively short distance (under 4 miles) where it was paralleled by the two "L" lines. The big issue was to speed up trips of the greater number of passengers. At that time, the great majority of rapid transit riders traveled to and from downtown. Skipping one station (58th or Garfield) meant that passengers from the far south end of the lines got downtown with no more stops than before, even though one former local station (Tech-35th or Cermak) was added to the Englewood and Jackson Park services. Speeding up service anywhere also benefited CTA , which could provide the same number of seats with fewer cars, trains, and crews if terminal-to-terminal time could be reduced. Of course, Garfield did eventually become an AB station but it was not to make the transfer easier for passengers changing between the Englewood and Jackson Park branches. In early 1982, a structural defect was discovered on the Dorchester Bridge over the ICG tracks on the Jackson Park branch. As a result, service was temporarily suspended south of 61st Street and all North-South Route trains were routed onto the Englewood branch. A shuttle was run from 61st to Garfield, chosen as the shuttle terminus so that passengers wouldn't have to go all the way to 51st. (Garfield was probably chosen over 58th because it has a higher passenger count and could be justified as an AB station easier.) Thus, on March 5, 1982 changed from a B station to an AB station and stayed that was until A/B service was suspended on the South Side Elevated in early 1993. 58th remained an A station until A/B service was suspended on the South Side Elevated in early 1993. 2.8 Q: At most stations, a portion of the platform has a yellow stripe painted along edge, usually toward the middle and about 10 feet long. It can't be a warning line to keep back from the edge, since it doesn't run the length of the platform. What does this line mean? A: The yellow band along the edge of many platforms are "conductor's safety stripes". Safety stripes were provided at elevated and unusually tight platforms as a way of assisting the conductor in knowing that the train was properly berthed. Although the berthing markers told the motorman where to stop his train (based on car length), there was no way for the conductor to confirm based on the berthing markers (which he likely could not see from his mid-train position) that the motorman had in fact berthed the train correctly. However, if the conductor saw that his mid-train position was within the safety stripe on the platform, he knew the train was berthed correctly and he could safely open the doors. There are a number of particulars and exceptions for how the safety stripes were deployed. The stripes were generally only meant for 6- and 8-car trains, since those were the trains that were mostly likely to be incorrectly berthed (since they approached the maximum length of the platform at many stations). Shorter trains were generally not an issue in this regard. As such, at stations where the longest trains scheduled to stop was 8 cars (i.e. the North-South Route, West-Northwest Route, West-South Route), the safety stripes were positioned for 8-car trains. At stations where the longest trains scheduled to stop was 6 cars (i.e. the Evanston and Ravenswood routes), the safety stripes were positioned for 6-car trains. (The exceptions were Belmont, Fullerton, and Loop stations, where although some platforms only dealt with 6-car Ravenswood and/or Evanston trains, the stripes were still for 8-car trains since they might stop there on a reroute.) Stations where the maximum train length was less than 6-cars -- the Skokie Swift -- had no safety stripes. Generally speaking, subway and expressway median stations tended not to have safety stripes either because their platforms were more than long enough for an 8-car train, negating the risk of an improperly berthed train. With a few exceptions (notably the Lake-Dan Ryan, because of platform drum barriers and pay on train procedures), the conductor's position was typically at the rear of the 3rd car or the front of the 4th car in 4-, 6- or 8-car trains. Most safety stripes were yellow. These were regarded as "permanent safety stripes". There were also, on occasion, white "temporary" safety stripes. These covered temporary operations, such as a moved berthing due to construction. On the Ravenswood, the white safety stripe was for a 6-car train with the conductor at the rear of the 2nd car or the front of the 3rd car. Today, those safety stripes that remain tend to be faded, peeling, or worn. That is because the stripes are no longer needed following the elimination of conductors by the CTA and they are no longer repainted on the platform edges as they wear or the platform is replaced. 2.9 Q: Why aren't there public restrooms in "L" stations? A: Many, though not all, "L" stations were outfitted with public restrooms until the 1950s. The Dearborn Subway, opened in 1951 (but designed in the late 1930s and early 1940s) was the last line to open whose stations had public restrooms. The next line to be designed -- the Congress Line, opened in 1958 -- began the trend of omitting this feature in new stations. Since then, existing public restrooms have been closed, most in the 1970s. Today, the only restrooms outfitted in "L" stations are for employee use, and existing restrooms have been converted to this function as well. The basic reason why restrooms are omitted in new stations and closed (to the public) in existing ones is the lack of funds to maintain the facilities, which the public can be rather rough on. In the post-World War II era, security in the restrooms also became a concern, compounding the maintenance issue and leading to the closure of the existing facilities. In the September 27, 2005 edition of the Red Eye, CTA spokeswoman Sheila Gregory said the no-restroom policy won't be changing soon. "Restrooms require significant resources to provide the necessary level of security and maintenance," Gregory said. "CTA does not have the financial resources required to construct or maintain these areas." 2.10 Q: On some platforms, I see signs that read "Rush Hour Stop" on poles, some of the the light posts, canopies, etc. when the stations are open and trains stop at these stations even when it's not rush hour. What's the deal with these signs and where did they come from? A: The old "Rush Hour Stop" signs at many stops are indeed somewhat cryptic. They reference where trains will stop at different times of the day. They are typically toward the end of the platforms, away from the stairs or station house access, or wherever cars would only berth during rush hour when longer trains are run. Off-peak, when shorter trains run, you cannot board a car there. The problem, I think, is the word "Stop". It seems to suggest to a lot of people that it's making reference to the station itself or the stopping pattern of the train service. If the word "Stop" was replaced with "Boarding" or something, that might have helped. This confusion might be one reason why the CTA doesn't use them in their current signage system anymore. But, while new stations do not receive them, there are still many existing ones around the station that continue to pique people's curiosity. 3.1 Q: Why doesn't the third rail short out when it gets wet or rained on? Well, this is really a question for an engineer and I'm an urban planner, so I'll do my best. Basically, water can only make something short out if something else is grounding that object. Because the various places where the third rail is connected to something else (i.e. the ground, a power source, etc.) are insulated, there's nothing to cause a short. The only way it could short out as a result of water is if it were completely submerged and thus the water were touching something else at the same time or if it similarly acted as a conduit between the third rail and another object (like, say, a person). In one sense your answer is correct but, in fact, the third rail does "see" a low grade "short" when it rains. I worked on the West Side "L" as Motorman, Conductor, Towerman and Flagman for several years before moving on to more technical careers. As you are aware, the third rail sits on ceramic insulators that are mounted on non-conducting dowels. The dowels are often mounted into the wooden cross ties (and wood is also non-conducting, when dry). As you've undoubtedly noticed, most of the area along the track is covered with grime and rust. Much of this material is from metal dust that is due to friction between the rails and wheels as trains pass. The surface of the ceramic insulators (a.k.a. "chairs") are well coated with a film of this dirt, as are the dowels and cross ties. When dry, the rust particles are not very good conductors of electricity, and there isn't enough fresh metal dust to conduct a lot of electricity, either. Up on the "L"TM structure, when conditions are dry, the third rail is not particularly hazardous. While acting as a Flagman for Carpenter crews replacing ties or sections of the wooden catwalk that runs between the tracks, I've actually witnessed carpenters who would SIT on the third rail while pounding nails! (If working at ground level, however, the same crewmen would avoid the third rail like it was a cobra.) The interesting thing is, that if the weather was threatening, as soon as the first few raindrops fell, the foreman would call it quits, the crew would drop everything, and we'd all hightail it for the nearest station. The way it was explained to me is that when the coating of metal dust and rust gets wet, it becomes more conductive and there is a significant amount of current leakage between the third rail, over and through the dirt covered wood, and into the steel of the "L"TM structure. To put it another way, there actually is a low grade short, all along the track. And if you are walking near the third rail, your footsteps may compress this slightly conductive grime so it conducts better, and you can get shocked. Of course, if you actually brushed against the third rail, under those conditions, it'd probably be fatal. If the right-of-way is at ground level, the situation is more hazardous because there is no layer of wood between you and the earth. One of the Supervisors told me you can actually see the leakage on the instruments at the power substations. He said it looks the same as if there are one or more trains running in a section that is actually unoccupied and, if it rains really hard, the film of dirt is washed off of the insulators so the amount of leakage (lost power) goes down. Obviously the reason why none of this is evident to the casual observer is that the short, or leakage, is spread over a large area. Picture the volume of water that comes out of the nozzle of a high pressure fire hose (call it X cubic feet per minute) and spread it out so the stream is three hundred feet wide, instead of three inches wide. You would have the same volume of water moving, in both cases, but in the case of the 3" nozzle it has so much force that it can blast holes through a plasterboard wall, while in the other case it might appear as a slowly moving 1/8th inch film of water. 3.2 Q: What is the story behind the abandonment of two of the four tracks on the Ravenswood between Armitage and Chicago? Is this why Evanston Express trains now make all local stops south of Belmont, they can't overtake Ravenswood trains anymore? Why is it only two tracks between Chicago and Tower 18? 3.3 Q: What are those stingers used for that you see along the CTA tracks? I assume they do something along with the third rail, but what do they do exactly? A: Hand jumpers, also known as "stingers", are two four-foot long wooden handles, each having an eight-inch long metal contact rod attached and connected by a heavy-duty electrical cable. They are used when an "L" train gets stranded in a spot where none of the third rail shoes are touching the third rail and thus the train has no power to move. This is most common with short trains (two cars) on curves, switches or at grade crossings, but it happens elsewhere on occasion. Three people are required to properly sting a train. According to the Employee's Guide For Use of a Hand Jumper, the persons handling the jumper must check that the cineston or controller is in the OFF position and that heaters or air conditioners are switched off. Two people are required to handle the jumper: one on each handle. First, one end is applied to a dead third-rail shoe, then the other end is applied to a live third rail. Once the train is receiving power through the cable, the train operator is supposed to move the controller handle to apply one point of power, only long enough to get the train rolling, then move the controller to coast. At this point, the persons handling the stinger must lift the side touching the hot third-rail, then the side touching the shoe. 3.4 Q: I wanted to know about the smaller gauge tracks that are inside the regular tracks on some portions of the "L" . Were they old wide gauge tracks, then at some point the trains changed to standard gauge, but the old ones never removed? Or were they both used at the same time? A: There are two types of those old rusty tracks you see inside and along "L" tracks. The first type, which are seen on the North Side and Evanston Divisions, were separate tracks for freight operations. They are the same gauge as the "L" tracks, but are a second set of tracks offset from the "L" tracks by several inches. One track is between the "L" tracks and the other is outside the "L" tracks. They allow wider freight trains to clear the "L" platforms by creating a second set of tracks within what is essentially a single-track right-of-way. This is called a "gauntlet". These are no longer in use. The second type has both rusty tracks between the "L" tracks. These rusty, usually grime covered rails are called "Guard Rails." They are to prevent a disaster in the event a train derails. On sharp curves, crossovers (switches), crossings, and interlockings, other types of guard rail technologies are used. For example, on crossings and switch frogs the guard rail is typically a fabricated component of the running rail. The wheels ride on the outer rails, and there is a gap of several inches for the wheel flanges, then the inner rail. This virtually eliminates the chance of a derailment, while the truck is passing over the assembly. The straight-away type of guard rail is often used as an entry device, just before the switch or crossing, to guide a derailed truck to a more stabile position before it hits the points, frogs or crossing-track. On very sharp curves, as in a CTA yard or in the Loop, yet another technique is used. On these tight curves the leading wheel of each truck will try to climb over the outside rail, no matter what speed the train is moving. This effect is especially pronounced if both the wheel flange and the rail are dry. Part of the solution is a contraption which may be called a "flange greaser." Just before the train enters one of these areas the wheels contact a pedestal along side the running rail. The pedestal operates a pump connected to a grease reservoir and as each wheel goes over the pedestal, a very small amount of grease is pumped out where the wheel flanges can pick up a little. So, over time, the grease migrates throughout the curve or interlocking track. This reduces the rail-climbing tendency, and has the secondary effect of reducing the volume of that earsplitting squeal as the train rounds the corners in the loop. This accounts for the amount of heavy black grease on the ties and guard rails one usually sees when you pass an interlocking plant. 3.5 Q: I've noticed some abandoned "L" tracks along Paulina between Lake and Harrison. Were these once part of the Blue Line? Why were they never torn down? Do they someday plan to return this part of the system to use? If I am correct, wasn't there a Madison Street stop right there by the United Center? Why did they discontinue service on these tracks in the first place? A: That section of trackage along Paulina was never actually part of the 'Blue Line' (as we know it today), though it was used by the Blue Line's predecessor. What are today's O'Hare branch (up to Logan Square station), Forest Park branch (actually the Garfield Park Line, demolished to make way for the Congress [Forest Park] branch in 1958), and Cermak [Douglas] branch were all owned by the same company: the Metropolitan West Side Elevated. Before the Milwaukee-Dearborn subway opened in 1951, the Northwest Branch (today's O'Hare branch) veered south where the subway portal is today and joined the Douglas and Garfield Park Lines where the Forest Park branch of the Blue LIne and Cermak branch of the Pink Line meet today at Loomis Junction. The three lines then entered downtown together over common trackage. When the more direct subway route opened in 1951, the Van Buren-to-Milwaukee leg of the Northwest branch along Paulina was taken out of revenue service, but remained in nonrevenue service to move rolling stock and work trains. The Milwaukee-to-Lake section was taken out of nonrevenue use on August 4, 1964 and demolished after several years. The only section of the Milwaukee-to-Lake portion left is the steel trestle bridge over the Metra/C&NW (now Union Pacific) West Line, Milwaukee District (former Milwaukee Road) North and West Lines, North Central Service (Wisconsin Central), and a freight track switched by NS (former Conrail). It was not demolished because the work could not be completed without disrupting commuter/freight traffic. It now has signals for these railroads on it. The connections from either side are gone; it is now just a bridge on two abutments, coming from and leading to nowhere. The Van Buren-to-Lake section actually reentered revenue service between 1954 and 1958 as a way for Douglas trains to enter the Loop (via the Lake Street Line) while the Garfield Park Line was demolished and the Congress Line was being built. To create the section from Lake to Washington where the tracks curve east to join the Lake Street Line (the Paulina tracks originally flew over the Lake Street tracks, with no connection), new structure and tracks were built. A section over the Eisenhower between Van Buren and Harrison is also newer. This stretch - from Lake to Harrison - called the "Paulina Connector" remained in use as nonrevenue trackage used for train movements from 1958 to 2006. Without it, there would be no connection between the Blue Line and the rest of the system. There was indeed a station at Madison, which had signs on it that said "Chicago Stadium". Other stations were: Lake Street Transfer (a direct connection with the Lake Street Line, which had a station of the same name), Grand, Chicago, and Division. There was some brief talk in 1996 of bringing it back into service for the Democratic National Convention, but this never came to pass. However, the CTA rebuilt the deteriorating section of the track and elevated structure and placed it back in revenue service in June 2006 as part of the new Pink Line service. 3.6 Q: Can you tell me what the deal is with the heat lamps at the portals of the subway tunnels? They seem to be on at all times of the year, and the train seems to zoom past it too quickly to be of any real use. A: The heat lamps are typically located where there have been problems with water flow/ice accumulation, leaks into the subway and that sort of thing. The intent is to keep the ice from building up to the point that it could interfere with the tracking of the trains or impinge on the clearance height of a passing train. They do seem to be on 365 days a year, regardless of the likelihood of ice forming. There are some locations where the bulk of the subway lighting seems to be provided by the heat lamps these days! Hubbard/Milwaukee crossover is noticeably darker when a southbound train cuts off the light from the heat lamps! By the way, they can get very hot! In a train stuck basking under the heat lamps the temperature of the car interior can rise pretty quickly! 3.7 Q: Were there ever any plans to demolish the Chicago "L" system and replace it with subways, as has been done in New York and Boston? A; Yes! There have been several. But, none have ever proposed abandoning the "L" completely, just replacing it with subways in the business district. The first transit plan that included the removal of the Loop was the Plan for a Unified Transportation System for the City of Chicago in 1927. The plan called for several new subways, including a Michigan Avenue Subway, a State Street Subway, a Halsted Street Subway, and a Clark Street Subway. It also included a new Loop Subway under Lake, Wells, Van Buren and Wabash to replace the elevated, plus extensions out Lake (with a branch up Milwaukee) and Van Buren (with a branch down Blue Island). It was proposed again in the Local Transportation Plan for the City of Chicago in 1937. Again proposed was the State Street Subway (on which construction started the following year). Also proposed was a Van Buren-Dearborn-Lake Subway (with a branch up Milwaukee), a Wells Street Subway (connecting to the "L" at Hubbard/Franklin), and a Clinton Street Subway connecting Milwaukee and Van Buren. This was seen as sufficient replacement service to remove the Loop. It was proposed again two years later by the Chicago Department of Subways and Superhighways in the plan that included the construction of today's State Street and Milwaukee-Dearborn Subways. The plan also included the eventual construction of a Lake Street extension, a Congress Superhighway extension (today's Congress Line), and Blue Island branch of the Milwaukee-Dearborn tubes, plus a Wells Street Subway to allow the removal of the "L" . A 1958 plan suggested its removal again, with a Wells Street Subway and a Jackson Street Subway (running from Grant Park to a connection with the Congress Line east of UofI-Halsted) intended to provide replacement service. A weak 1962 plan suggested it once again. However, the alternate service suggested there  a subway connection between the Ravenswood at Chicago Avenue and the Milwaukee-Dearborn Subway at Lake/Wells and a southward extension of the Milwaukee-Dearborn continuing south under Dearborn were seen as wholly insufficient. The 1968 Transit Planning Study was the granddaddy of all the Loop replacement plans. It was very thorough, took up three volumes, and was planned down to station designs and construction timetables. It suggested replacing the Loop with a new Loop Subway under Franklin, Randolph, Wabash, and Van Buren. From Lake/Wells, Ravenswood and Evanston trains were to access it via a new Orleans-Clybourn Subway to Willow Street. Lake Street trains were to access it from a new Randolph Subway between Lake and Ashland. And there was to be a new subway in the Franklin Avenue Expressway (never built) to connect the about-to-open Dan Ryan Line. Also included in the plan was a new Distributor Subway, starting at the University of Illinois Circle Campus at Harrison/Morgan and running under Moran to Monroe, then east under Monroe. East of Michigan, the Monroe Street Subway was to split into two branches: one south to McCormick Place and one north to the Gold Coast. After this, it more or less started to die down. People realized that the money simply wasn't there to do it. After the February 1977 Loop crash, the subway replacement furor heated up again, but died just as quickly within a year when funding was once again seen as unrealistic. It is more or less accepted that the Loop is here to stay now, which I am grateful for. Chicago is pretty much the only city left that runs a downtown elevated system and that makes up pretty unique! That Monroe Street Subway, however, remains a valid plan, I think. There is still no direct subway (or "L" ) service to McCormick Place, Soldier Field, the Museum Campus, or the Gold Coast. 3.8 Q: The Congress (Forest Park) branch right-of-way is a lot wider than it needs to be. What is the extra space for? A: The extra width was for extra tracks. In 1953, the Chicago Aurora & Elgin interurban cut itself back from the Loop to Desplaines. The Garfield Park Line began operating on a temporary grade-level right-of-way during the construction of the Eisenhower Expressway and the CA&E felt it was too difficult to run their interurbans there. It was hoped, however, that the CA&E would resume running downtown when construction was over. There was extra room provided on the Congress right-of-way for the CA&E to lay separate tracks down the median for their own use, but the CA&E folded in 1957 and this never happened. A second island platform was built at Desplaines for them next to the CTA platform ended up going unused and was eventually demolished. Later, there were also various plans in the 1950s to divert the Lake Line onto the Congress at Kedzie. (Other north-south streets such as Cicero and Western were also suggested in various plans, but Kedzie was most commonly cited as the connection point.) The Lake "L" would (or might) have been demolished between Kedzie and the Loop and trains would have run south around Kedzie, then east to downtown on the Congress express tracks. In the 1958 New Horizons plan, the Lake-Congress express trains would have gone into a new subway under Van-Buren-Canal-Jackson, terminating in a loop under Grant Park. The CTA also considered laying express tracks for the Congress Line, but this also never came to be, possibly because the ridership wasn't there to justify express service. 3.9 Q: When the Blue Line emerges from the Milwaukee-Dearborn Subway east of UIC-Halsted station, there are two extra portals to the north of the two the Blue Line uses. What are these two unused subway portals for? Have they ever been used? A: The two portals to the north of the two active Blue Line portals east of Halsted were built into the line when the Congress Line and short section of connecting subway opened in 1958, intended for projected future lines that were never built. There have been several different proposals over the years for how to use the portals, many of which were tied to the fact that the Congress Line was designed to accommodate two additional tracks between the portals and the city limits, allowing for the possibility of increased capacity in the form of additional services running in the same right-of-way. When the Congress Line was being built, it was thought that the Chicago Aurora & Elgin interurban (which was running on the Garfield elevated that the Congress was replacing, see question 3.8) might be re-extended back downtown from Forest Park, running along side the Congress trains. Where the CA&E would have terminated was never concretely determined and the interurban folded before the issue became particularly relevant. While it's possible the interurban might have used these portals, it's far more likely they would have ascended up a ramp to the old Metropolitan"L" main line to terminate at Wells Street Terminal or another elevated location had they returned to downtown Chicago. Far more likely were several rapid transit subway plans proposed in the 1950s and 1960s. In the commemorative booklet published in 1951 by the city's Department of Subways and Superhighways (responsible for the planning and construction of the subways in the 1930s-50s) for the opening of the Milwaukee-Dearborn Subway, a proposed subway line is shown extending from a junction in the new subway at Lake/Milwaukee (see question 6.2) to the portal near Halsted/Congress. A connection is also shown between the Lake Line elevated and the then-proposed Congress Line near Kedzie Avenue, suggesting the plan was to reroute Lake "L" service down the Congress Line between Kedzie and downtown (no doubt using additional tracks within the Congress "L" right-of-way, see question 3.8) to terminate in a subway loop using the new Dearborn Subway and the proposed West Loop subway between Lake/Milwaukee and Halsted/Congress. The booklet explained that the extensions would be built, "as early as international conditions and financing problems permit." In the CTA's 1958 New Horizons plan, a new use for the portals (which were completed, along with the rest of the Congress Line, that year) was put forth. The plan proposed a new Jackson Blvd. Subway downtown, running from the portals at Halsted under Van-Buren-Canal-Jackson, terminating in a loop under Grant Park. The New Horizons plan also shows a proposed connection between the Lake and Congress lines, this time moved to Cicero Avenue, suggesting the plan was still to divert some or all Lake "L" service down to the Congress Line (again, probably on additional tracks built in the wide Congress right-of-way) to terminate at Grant Park via the Jackson Subway downtown. 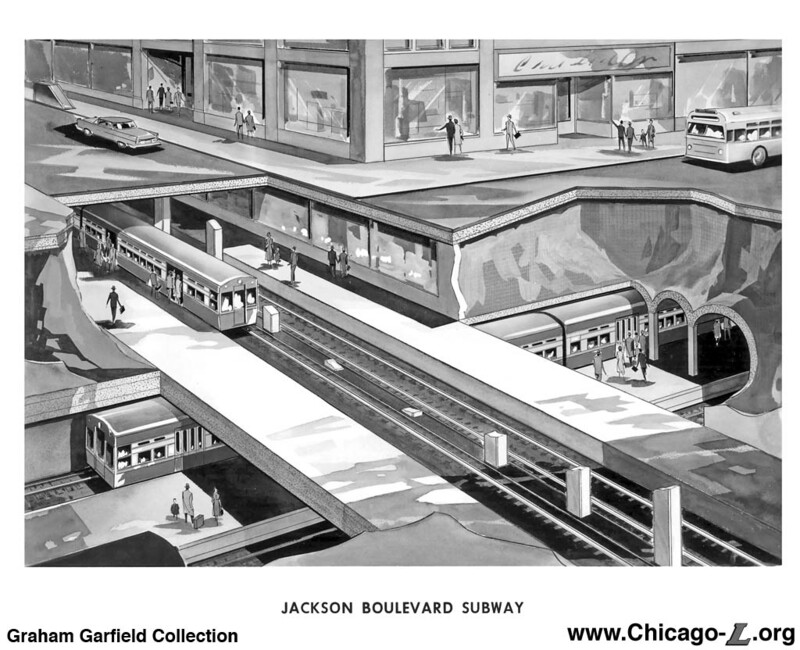 A 1962 Plan for improvements to the "L" system dropped the Jackson Blvd. Subway plan and returned to proposing connecting the Halsted portals with the Lake/Milwaukee junction via a new subway under Clinton Street to serve the commuter rail stations and West Loop. This plan probably would've also included a diversion of Lake trains to the Congress Line as in previous plans. 3.11 Q: Most of the "L" structures in the city are comprised of steel girders. However, the structure between Lawrence and Howard on the Red Line and up past Central Street on the Purple Line is built on a solid right-of-way above grade, similar to the paralleling Metra/Union Pacific right-of-way. How were these above-grade structures built? When was the above-grade right-of-way built and why wasn't a standard steel elevated structure used? A: The type of construction employed on the Red Line north of Lawrence and on the Purple Line is known as a "solid-fill embankment", referring to the fact that it is an elevated right-of-way shored up by two retaining walls filled with solid debris like rocks, dirt, et cetera. These sections were built piecemeal over several decades. This entire section used to run at grade. The section between Howard and University Place in Evanston was elevated in 1908-10, the portion between Howard and Lawrence was elevated in 1914-22, and the final part to be completed was the north end of the Evanston Line, from University Place to the Evanston-Wilmette city limits, between 1928-31. A short section of the embankment just north of Church Street in Evanston would remain unfinished until the 1940s. As for why this portion was built solid-fill rather than a steel elevated structure, there may have been some preference by the city or the communities in terms of aesthetics or noise abatement. But the overriding reason was because this section of the "L" also ran freight service and it was felt that a sturdier elevated right-of-way was needed to safely support the weight of potentially heavy freight cars. A connection between the portion's elevation as solid-fill and this type of construction's desirability for freight service is evident when one recalls how the extension north from Wilson was secured in 1908: Northwestern Elevated service was extended north to Central Street in Evanston using trackage owned by Chicago Milwaukee and St. Paul Railway. The CM&StP had previously operated commuter steam trains over this line, and continued to operate freight service after the line was electrified with overhead trolley wire for "L" service. In 1920, responsibility for operating the freight service over the North Side "L" north from the Buena Interchange Yard (the connection with the Milwaukee Road) passed to the Northwestern Elevated with their purchase of two Westinghouse-Baldwin electric freight locomotives, but ownership of the line north from Wilson technically remained with the Milwaukee Road. The "L" companies merely leased it until the CTA finally purchased the ROW in 1953. The requirement to provide freight service was passed to subsequent owners -- for the CRT, and then the CTA -- and continued until 1973. 3.12 Q: I've noticed that the elevation of the tracks on a stretch on the Green Line around the Illinois Institute of Technology goes up and down like a roller coaster. Someone once said this was to facilitate gaining and reducing speed when entering and leaving stations. Is his explanation correct? If so, why wasn't the principle used elsewhere on the system? A: Actually, the idea of the rises and descents in elevation being for slowing down for and speeding up after stations is a long-held Chicago urban legend. Although there is some logic to the idea of this statement -- perhaps bolstered by the fact that the South Side Rapid Transit used steam locomotives at the beginning, which have slower rates of deceleration and acceleration than electric cars -- it is not, in fact, the case. The fact that other "L" lines did not do this as well to aid in station stopping pokes a hole in the theory, and the fact that they were not original to the construction of the line, but in fact were added after the company switched from steam to electric traction more or less puts a nail in the coffin of that idea. Those humps in the South Side Elevated between Roosevelt Road and 40th Street were added about 15 years after the two-track line began operation. As service improved and ridership grew, the South Side Elevated found itself with severe capacity problems. The company decided that it needed to increase capacity on its main line and run faster trains to meet demand. Thus, plans were formulated at add a third express track between 12th Street and 43rd Street on the South Side main line. The narrow right-of-way would make this difficult, so it was decided to use the alley that ran adjacent to the elevated for extra space. The city agreed to permit the company to do this in 1903, but with one stipulation: the company had to demolish its ground-level stations and replace them with mezzanine-level facilities high enough to allow traffic to pass underneath. This meant that the height of the structure would have to be raised at the station locations to provide sufficient clearance for vehicular traffic passing underneath in the alley. This task was achieved by setting jackscrews underneath the structure to support it while extra sections of steel were added to the bottoms of its girder posts. "They did the whole lifting job without interrupting service for so much as a day." former CTA executive director and transit historian George Krambles once said. "Today, we engineers would find a thousand reasons why such a thing was impossible. But the 'L''s builders were blissfully ignorant of what they couldn't do. They assumed that for every problem, there is a solution." Truly an example of Chicago's "I Will" spirit, some might say. For the most part, the existing northbound track became the express track and a new northbound local track was constructed to the east of the existing structure. New northbound platforms were built between 18th and 39th streets and new southbound ones were added at 12th and Indiana stations. All but 12th Street station had their elevations raised with grades of up to 1.44%, creating a rise-and-fall "roller coaster"-type profile in the elevated structure. By spring 1907, the work was largely completed and express service began on Match 26, 1907. Because there was only one express track, express trains operated northbound in the morning and southbound in the afternoon. Express trains were able to make the trip from Congress to 43rd Street in just ten minutes. 3.13 Q: Today, the Loop -- as in Chicago's downtown district -- is synonymous with the "L"'s Loop Elevated. But some have suggested that this name for Chicago's downtown originated not with the elevated line but with a streetcar loop that encircled downtown years before the "L" opened? So, which is truly the origin of the nickname? A: The origin of the nickname "the Loop" for Chicago's downtown is not altogether clear. Many historians and present-day guidebooks have asserted that "the Loop" has meant downtown since the 1880s, over a decade before the Loop Elevated opened. It it clear that people referred to the five networks of cable car lines' terminuses that encircled several blocks in the central business district as "loops", but beyond that it is less than straightforward. But, according to transit historian Bruce Moffat, author of The 'L': The Development of Chicago's Rapid Transit System, 1888-1932), those loops didn't equal "the Loop." In a July 26, 2004 article in the Chicago Tribune, Moffat described that digging through mountains of records, examining spools and spools of microfilmed newspapers and studying every archive he could in researching his book, the only references he found were to the loops as transportation routes. "It was not the Loop as a proper noun," he says. That didn't come until the arrival of elevated railroad lines into the central business district, according to Moffat. 3.14 Q: Why do the trains always go so slow down between [location] and [location]? A: Well, the reasons that trains may slow down in a given area of track varies from location to location. The reasons can be particular and unique. For instance, a train could be immediately ahead. But if trains consistently slow down in the same area, more than likely there is a Slow Zone in that location. A Slow Zone is a section of track through which trains operate at reduced speed. They are set up when conditions require trains to operate at a reduced speed for safety reasons. There are two types of Slow Zones. If the work is fairly short-term, the zone will be marked manually with orange and white-stripped warning signs and lamps, providing protection for people, trains, equipment and tracks. There will also typically be flagmen, if there are workers present on the tracks. Train operators are required to observe the restrictions of the slow zone in their manual operation of the train. If the work is long-term or it is the result of a condition which is persistent and not currently being worked on, a more "permanent" Slow Zone may be put in place. (Of course, it's not really permanent per se, but it may be present for a longer period until the source can be addressed.) In this case, signage and flagmen may not be present because no workmen are present, but instead the automatic train control (ATC) system -- which controls the signals, transmits the maximum allowable speed to the train, and will engage the brakes if an operator exceeds the maximum speed for more than 2-3 seconds -- may be "dialed down" to reduce the maximum allowable speed in that zone, creating a Slow Zone that is enforced by the cab signal system. Thus, adherence to these restrictions is enforced not just by the operators' proper operation of the train but also by the cab signals and the trains' automatic train control system. This second type of longer-term Slow Zone may be established because of one of any of five conditions: track, structure, construction, signals, or traction power. The maximum allowable speed in a particular slow zone differs depending on the cause and severity of the condition, along with other factors. Generally, it will be a speed of 15, 25 or 35mph. The CTA Structure Maintenance Department regularly issues a slow zone map for the system. A copy is posted to the Reference Documents page of the CTA's web site. A Slow Zone will remain in place until the maintenance project or adverse condition is completed or resolved. A Slow Zone remains in place whether or not workmen are actually present, as a project may leave a section of track in such condition as not to allow trains to operate at maximum speed in the interim (for example, if the track partially stripped, with spikes out, or needing realignment; guard rail out; or work being done under an elevated structure). As for why CTA performs track and structure maintenance work that requires Slow Zones during operating hours... Well, it's just about the only time they can. To avoid impacting the rush hour and minimizing the effect on the largest number of customers, "L" maintenance is performed during off-peak hours -- nights, middays, and weekends. Part of the cause, ironically, is the extensive service the CTA provides. Whereas most European urban train lines shut down for several hours at a time at night, using this off-time to perform maintenance, the "L", on the other hand, runs 24 hours a day on two lines and shuts down for only about 3 hours a day on four of the five other lines. This leaves very little time for maintenance to be performed when trains aren't running, requiring most of it to occur during operating hours. Of course, if the CTA simply shut down a line to perform maintenance, the work could be done much, much faster. But this would be undesirable to the vast majority of customers, so the CTA does the work under traffic, which slows and draws out the work and slows but at least doesn't shut down the trains. It's a tradeoff (or, to some, a catch-22) of operating a 100+ year old railroad whose service is in high demand! For more information about specific slow zones, visit the CTA's Web page on slow zones and track improvement projects. 3.15 Q: What are the WA Zone signs/WA Control boxes along the right-of-way? What is a WA Zone? What does "WA" stand for? A: The Workers Ahead (WA) warning system is intended to provide an additional measure of safety for personnel working at track level in areas of limited visibility, such as curves, in addition to normal safety precautions such as slow zone signs, flagmen, and portable track trips. The WA system, when activated, reduces the maximum allowable speed in the cab signal system below the normal maximum speed to assure that trains operate at a reduced speed even if other safety measures are not followed or seen in time due to the limited visibility in the area. Generally, in areas where cab signal allowable speed is normally set at 55 mph, allowable speed will be reduced to 35 mph or less. At some locations, such as several on the Orange Line, the allowable speed is reduced to 15 mph. The maximum safe speed through the area may be lower than that enforced by the cab signal system, and wayside signs, flagmen's instructions, and other safety measures must still be followed. However, the forced reduced speed provides an extra measure of safety and better ensures that operators will be able to see and follow these other indicators in time where visibility may be impaired. A WA Zone is marked by signs that read "Begin WA zone" and "End WA zone". The activation and deactivation of the system to controlled by a WA Control box located at each end of the zone. When the system is activated by an employee at the Control box, operators of approaching trains encounter a flashing yellow wayside warning light beneath the "Begin WA zone" sign. Upon entering the zone, the cab signal indication of maximum allowable speed is reduced below the normal allowable speed. The normal maximum allowable speed will resume once the train passes the End WA zone sign. 4.1 Q: Why were the 4000 series cars incompatible with all the latter series cars? Why did the CTA make the same "mistake" again by making the 6000s incompatible with later cars? Wouldn't it have made more sense to have a fully compatible passenger fleet? A: The issue of compatibility is a somewhat complicated one because there are, of course, different levels of compatibility. But, this aside, the basic answer to why the cars ceased being 100% compatible with the previous series is that transit technology advanced in the interim between the series so much that to make the new cars backwardly compatible with the older ones would have meant that useful new technologies would have gone unused and the riding public would have continued to have been plagued with antiquated equipment. The CTA faced this dilemma more than once. The PCC cars' dynamic braking and batteries, on the other hand, did not store any power from propulsion. The dynamic braking simply dissipated the energy from the motion of the train as heat in the motor resistors, and the batteries were solely for emergency lights and brakes and "floating" power for the controls (normally they are not drained; rather, the motor-generator set powers the controls with the batteries only being a reserve). The control on the PCC cars was all electrically controlled, in a manner analogous to that of the 4000s, except that the motor contactors are operated electrically instead of pneumatically. The PCCs' brakes were electrical too: the motor circuit 2qw "rearranged" when braking is called for so that the motors are used as generators, to convert the energy of motion to electricity. As the car comes to almost a halt, the motors turned slowly enough that their braking effort was practically nil. The control sensed this and applied the parking brakes, which are an actual friction-type brake. This causes the final stop in the PCC cars. The gist of all this is that these systems are fundamentally different and could never be trained together. While this may seem like a problem, there were 774 PCCs, about 3/4 the CTA's fleet, so it really didn't represent a terrible operating restriction. The 5000s and 6000/1-50s did differ somewhat, but were compatible and were often trained together in Ravenswood tripper service. If the CTA had chosen not to go with PCC technology simply to make the cars compatible with the aging 4000s (which were due to be retired soon anyway), they would have been stuck with an out-of-date technology that was not only annoying to the riding public but difficult to get replacement parts for. The CTA again faced the same dilemma in 1964 when it was time to order the next series of cars after the 6000s. PCC technology was being phased out in favor of new technologies and the CTA again had to make a decision weighing backward compatibility against state-of-the-art technology. They chose the latter and the 2000-series became the first series in the High Performance family. Some of the new features added included AC-powered fluorescent lighting, remote-controlled destination signs, solid state battery-charging converters, a new truck design (the "CTA-1"), air conditioning, and a host of other things that the 6000s lacked. Because of the many differences, a 2000 couldn't be MUed with a 6000 because there were systems on one that the other couldn't control. All series after the 2000s have also had technological innovations (each had newer trucks, the 2400s had sliding doors, the 3200s have microprocessor control logic and diagnostics, etc. ), but they remained similar enough that they can all be trained together. When the CTA first started the High Performance family with the 2000s, it was tough operationally because they had 180 cars that they couldn't use with any other series, but after thirty years, the CTA now has an entirely compatible passenger fleet. As said before, there are different levels of compatibility. When 4000s were trained together, the only systems that had to be connected between cars was the air hose and a jumper cable to control the motors. All other systems (doors, lights, destination signs, etc.) were controlled in each car, necessitating a conductor in each (at least until the 4000s were retrofit, but this is an entirely different subject, see Question 4.2 for more). With the modern cars, there were two couplers: a mechanical coupler (to physically connect the cars) and an electric coupler (or, more precisely, the electric portion of the coupler, to connect the electric, trainlined systems which could now all be controlled from one location). Not only were these systems totally incompatible, but the CTA chose to use a different type of coupler, so not even dead cars could be hauled! The PCCs used an Ohio Brass Form 5 coupler instead of a Stearns & Ward coupler (which is what the 4000s had) for several reasons. First, the Stearns & Ward coupler was a somewhat unsatisfactory compromise design to begin with. It was a knuckle coupler, and was specially designed to be able to couple to both another 4000 knuckle couplers as well as the wood cars' ink-and-pin couplers. (Recall that the 4000s could and did run with woods regularly as late as the early 1940s.) As compromises usually are, it was not particularly good at being either a knuckle or a link-and-pin coupler. When the 5000s were being designed, one of the features that was going to be incorporated was automatic coupling and uncoupling, from a button in the cab. (This was also the reason they went with an automatic electric coupler rather than a cable that had to be plugged in.) This was supposed to be accomplished by means of a hydraulic pump, run by electricity, that would move a piston that operated the coupler. More than likely, a desire to save money prevented it from being put onto the 6000s. A tightlock coupler, like the Form 5, was required to keep the electric portion from moving around and losing contact. There were some modifications made later on so cars with incompatible cars would be run together. There were adapter couplers available to allow a 6000 to move a 4000 (or vice versa) when necessary. When 4000-series car S-1 was converted for work service, it became the only 4000 to get Form 5 couplers permanently. All other 4000 work motors retained their standard couplers, hoses, etc. until retirement from this service. Because the propulsion package on the 2000s was significantly more powerful than on the 6000s, along with all the additional systems being controlled, a new 68-pin electronic coupler was used (as opposed to the 5000s and 6000/1-50s 54-pin coupler), but the same Ohio Brass Form 5 mechanical coupler was still used. This means all cars after 1947 can be mechanically, but not electrically coupled, a handy capability for emergency movement of a disabled train. So these later cars are, at some level, at least minimally compatible. 4.2 Q: Above you said the 4000s didn't have remote door control and a few other features, but I remember seeing them with these features. What gives? A: At the time the 5000s arrived and the 6000s were being designed, the 4000s were as I described them above. But, yes, later the door control on the 4000s could be handled from any car. After the CTA ordered the first set of 6000s (6001-6200), they set about retrofitting the 4000s to make them operate more safely, economically and basically more like the forthcoming 6000s. By the time the 6000s started rolling in, the changes had been pretty much completed. In this overhaul, the 4000s were given multiple unit door control, battery feed, the trolley feed on Evanston cars was tied together so only one pole per pair was needed, and they were paired up into "semi-permanently coupled pairs" (as opposed to the "married-pairs" of the 6000s ), usually in consecutive numerical order. Additionally, the destination signs (which were all still hand-operated) were changed to display either the route names (i.e. "Ravenswood" or "Lake A") or both terminals (i.e. "Howard - Jackson Park B") so they wouldn't have to be changed for the reverse trip. The number of signs per car was reduced from four to two, not counting the destination board on the front. All this allowed a two-man crew to staff a train of any length. But there were still enough differences that the 4000s couldn't be trained with later cars (except 4000s converted for work service, which received the same Ohio Brass Form 5 mechanical coupler as later series). 4.3 Q: When were the last of the wooden cars retired? A: The last of the wooden cars were retired from passenger revenue service December 1, 1957 from the Kenwood Branch. As recently as 1955 they still saw limited service on the Evanston, Ravenswood and Douglas Lines, but with delivery of the 6000-series in full swing, they were no longer needed. The Kenwood Branch was earmarked for abandonment by CTA early on, so it was a perfect place for the wooden cars to ride out their final days. The last of the wooden cars were originally from the Metropolitan West Side Elevated and finished out their service on the Ravenswood, Stockyards and Kenwood lines. I believe the South Side branches last ran with cars from the 2858-2927 series. At the end of the Kenwood, all of cars numerically above 2900. The Ravenswood required more cars, so there were probably 2790-series cars still running up till the end on that particular line. Evanston, of course, had to run with trolley-pole equipped cars, and so 1700/1800 series cars finished up on this line. 4.4 Q: I've noticed a two car unit numbered 3457-3458. I thought only 256 3200-series cars were ordered -- not 258. Also, 3458's sides were not corrugated like the rest of the 3200s. What is with these two cars? A: Yes, there were only 256 3200-series cars in the original order from Morrison-Knudsen in 1993-1994 and all of these 3200s are on the Orange, Brown, and Yellow Lines. Unit 3457-3458 is a bit of an exception and an oddity. This is a situation where a two-car unit was in an accident or otherwise impaired, but only one of the cars was unusable. What the CTA often does in these situations is break that pair (as well as another pair in the same situation), scrap the unusable car from each pair, then remate the two usable cars into a new set. Sometimes they renumber them into consecutive numbers, sometimes not. This has been done in many car series - the 6000s (in one example, car 6309 of pair 6309-6310 was wrecked at 40th/Wabash in 1966 and car 6453 of pair 6453-6454 was destroyed in the fire at Tech-35th in 1962, so 6454 was renumbered 6721 and 6310 was renumbered 6722 and they formed a new pair) and the 2000s (2039 burned in '86 and 2130 was wrecked in the Harlem Yard in '79, so 2040 and 2129 formed the new pair 2182-2182 in 1990) just to name a few - but usually the two cars repaired are of the same series. This is what makes 3457-3458 so unusual. 3031 was damaged in a derailment at Wilson on March 15, 1988 when a northbound North-South Route train it was a part of split a switch, but its mate 3032 was OK. It was renumbered 3458 (hence the reason why a car numbered in the 3200-series doesn't have corrugated sides: it's really a 2600-series car), but its mate, 3457, doesn't share the same origin. Car 3457 was a new car built by special order from Morrison-Knudsen in 1994 specifically to be a mate for 3032 because another 2600 apparently wasn't available. The pair was placed in service March 25, 1994 and assigned to the Purple Line. 3458 had no conductor's position; all controls were in the full-width cab of 3457. This is also the motorcab, so this predicament would seem to make the car ill-suited to the one-man operation that often occurred on the Evanston Shuttle (and now occurs everywhere). But since Howard Yard was the only location on the system that housed both 3200s (Skokie Swift) and 2600s (Evanston and Howard-Dan Ryan cars), the car was assigned there. The pair is an interesting mix of equipment. From a signal standpoint, 3457 is like a 2600-series car, using 2600-style signal coils. 3457 does, however, have a microprocessor cam control and an inverter like a 3200, while 3458 has a standard cam control and a motor-alternator like a 2600. 4.5 Q: When is the 2600 rehab contract finishing? A: The 2600-series rehabilitation project was completed in October 2002, nearly a year ahead of schedule. 4.6 Q: Why do "L" TM cars have only two doors per side? I look at many different railcars in America like New York, Philadelphia, Los Angeles, Boston... and most of them have three or sometimes four doors per side on their railcars. How come CTA railcars only have two? A: The number of doorsets per side is partially affected by the car length (see question 4.8 for car length limitation issues) and the need to maintain the structural integrity of the carbody. The more doors you cut into the car, the more of the carside there is that cannot be stiffened up structurally. Additionally, the ridership levels and car loads don't necessitate more than two sets of doors per side of each car. 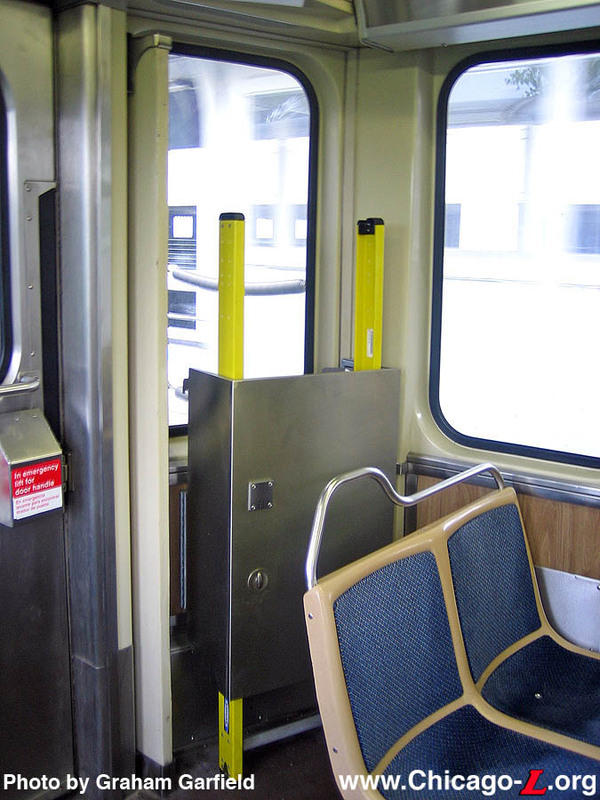 Although Chicago has some very high ridership lines and peak riding times, on average the number of people crammed into each car is low enough to be efficiently handled by just two doorsets. In 1913-1914, the original 4000-series cars were built with three doors per side in anticipation of high loads expected from the forthcoming subway (which it turned out wasn't as forthcoming as they thought; it would be another 30 years until Chicago's first subway was completed). However, it was found that the third door was unnecessary to handle the "L" loads and only complicated operations, so they saw very limited use and were eventually sealed; they were omitted from later 4000s and car series. Someplace like NYC, on the other hand, has such high ridership levels that efficient loading and unloading requires many more doorsets. This type of adaptation for different loads can be seen well in London where cars on the busier lines (like the Circle Line, Hammersmith & City Line and some District Line sections) have cars with three and four doorsets per side, whereas less busy lines have fewer. 4.7 Q: Are the CTA railcars shorter than that of the NYCTA (New York City Transit Authority) or other cities? To me they look a lot shorter in length. A: Yes, CTA cars are shorter than an NYCT/IRT Division car. Those cars are around 51 feet long. Chicago's car length was really dictated by the need to be able to traverse those tight curves in the loop and at places like Harrison/Wabash. Remember, these were private undertakings so condemnation/eminent domain was not an option for them, and every curve easement meant buying more real estate. Each "L" car is 48 feet long and, since 1950, are permanently coupled into two-car married-pair units. 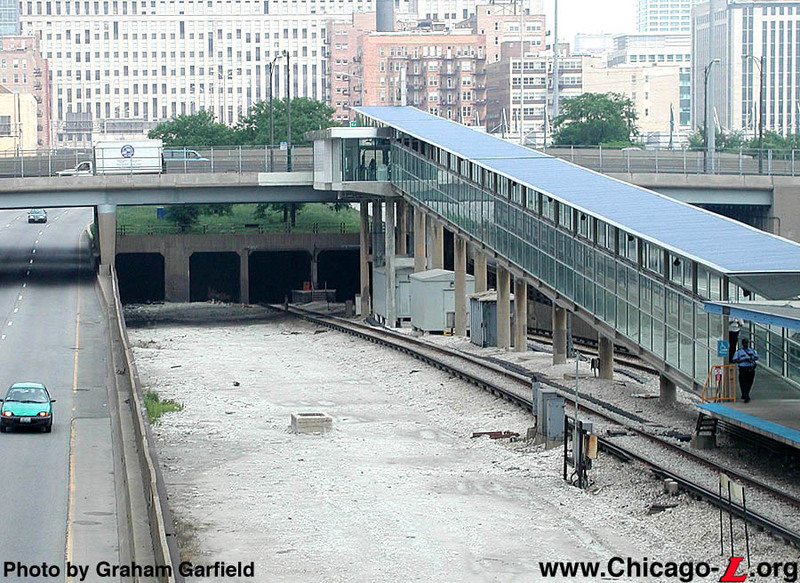 I think a longer car might be more useful now, but Chicago has built it's system into a 48 foot-only clearance. Around the time of the Congress Line, there was consideration given to operating longer-length cars on that line. The proposal was for new, special 60-65 foot cars, but the proposal was dropped because the cars would be confined to that line only, among other reasons. 4.8 Q: I've noticed there are lights, often in sets of three, next to every door on each car. The color and number of lights next to the doors varies depending on the series of train series. What's the deal with these lights? What exactly do they all mean? What are the different colors? Why are there different configurations of these lights on the older and newer train series? There were, for a long time, four colors: red, yellow, blue, and white. Yellow indicates that the parking brakes are applied. This is only when the dynamic braking has given out (below about 3 mph) and when standing still. It also comes on when the train is put into emergency brake (this is the reason for the burning smell when somebody dumps the train at a high speed). Red is when the doors are open. White is when the battery charging on a car has quit working. It's similar to the GEN light on an automobile. It means that you are now operating on battery exclusively. The blue light indicates that excessive current has been drawn and the circuit breaker on the car has tripped, or that there is some other propulsion control malfunction. The most common reason for excessive current draw is that a motor has failed. When the circuit breaker has tripped, the audible alarm will ring in the cab. The motorman must then operate the POWER RESET switch to attempt to reset the tripped breaker. If the bell keeps quiet when he takes power again, all is okay, and the blue light will stay lit so the shop can examine it at some point. If the bell sounds again, the fault cannot be fixed, and the motorman turns the seven-point switch off in the car with the blue light to cut it out. There is an expression among operators -- "getting a blue light" -- for the minor equipment problems that cause this light to be activated. A fifth light, green, has also been added to the mix. The green light is a Low-Speed-Door-Interlocking-Bypass (LSDIB) light. LSDIB is a mechanism in the door control system that prevents the doors from being opened electronically at high speeds (say, over 10mph or so). This Low-Speed-Interlock engages when the train travels at higher speeds and prevent the doors from opening if someone inserts a key into a door control box in any car and tries to flip the toggle to open the doors. It automatically disengages when the train slows to 10mph or 5mph or so. The bypass is needed when the interlock will not disengage, preventing the door from opening even if the train is at a full stop. If the bypass is engaged, the interlock does not engage. The 2400-, 2600-, and 3200-series cars were delivered with the LSDIB, but it was disabled on the 2400s at some point after delivery because of a roll it played in some less-than-Standard Operating Procedure door-opening practices used by some conductors during pay-on-train hours. (This is also why the door controls went from buttons in the 2400s to toggle switches in the 2600s.) In any event, once a more reliable system was found the LSDIB was reinstalled on the 2400s around 2000 and it was during this time the green lights were installed on the exterior (as-built, the 2400s had no exterior indicator light for the LSDIB). The 2200s, the only series that were not delivered as-built with the interlock feature, were the last to get the LSDIB added in 2001. If you stand at the door of a train or near a sealed door control box on a 2200 or 2400, you can sometimes hear the interlock activate and deactivate. It's a slight "click" sound near a door, or a very loud series of clicks in the old door control boxes on the 2200s and 2400s. The lights are arranged differently on the various car series currently in service, although there are some similarities between some series and some consistencies across all cars. In general, every doorset has a red light and most car types have only one green light per married-pair (since there's only one bypass switch per pair). There are also, generally, slightly different light arrangements on the odd- and even-numbered cars within a given car series. Getting specific, the Budd 2200s are unusual in being the only car series with a set of four lights in a row near half of its doorsets. The doorset near the #1 (front) end of the odd-numbered car has a red light on one side and a green light on the centerpost between the blinker doors, while the #2 (rear) end side doorset has, from top to bottom, red, yellow, blue, and white lights. The even-numbered car has the same configuration, but without the green light at the #1 end of the car. The odd-numbered 2400-series cars have a red light and green light next to the doorset at the #1 end and red, yellow, and blue lights next to the #2 end side doorset, while the even-numbered cars have the same except for the green light next to the side doors at the #1 end. On the 2400s, the green light is a separate blister added below the single red light, rather than part of the same cluster as on other series' units. The Budd 2600-series cars are the only units, post-rehabilitation, that not only have the same light configurations on the odd- and even-numbered cars but have two green lights per married-pair. On both cars of the pair, the side doorset near the #1 end has (top to bottom) a red, white, and green light while the doorset near the #2 end has a red, yellow, and blue light. Finally, the odd-numbered cars of the MK 3200-series, the only series that were delivered with exterior LSDIB indicator lights, have a red-white-green light configuration at the doorset at the #1 end and red-yellow-blue lights next to the #2 end side doorset, while the even-numbered cars have the same at the #2 end and a red-white-red configuration next to the side doors at the #1 end. 4.9 Q: Why does Chicago use the "theater row" seating in their cars -- that is, an aisle with rows of transverse seats on either side of the aisle. It seems a clumsy and inefficient use of space, it makes it difficult for people to move about the car during rush hour. Why not have seating against the walls of the cars and more standing room in the center of the cars as in the New York, DC and London subway systems? "The original coaches placed in service on the elevated roads had four stationary cross-seats at the center of the car with longitudinal seats throughout the remainder of the car. This seating arrangement was maintained in the coaches for a good many years. When electrically operated motor cars were first installed, they were equipped with longitudinal seats throughout. This condition existed a good many years until finally all new motor cars were equipped with the four stationary cross-seats at the center of the car and longitudinal seats for the remainder, the same as the original coaches. This arrangement was maintained until the sentiment for the cross-seats became so strong in Chicago that these were installed on all new equipment. A short longitudinal seat at each of the four corners of the car is used with the cross-seats to provide a well near the end doors of the car. With the exception of the return to the longitudinal seats on account of the center doors installed in the first steel cars built in 1914, the plan has been to install all cross-seats in all cars. Seven reversible seats were first placed on each side of the car, then eight, and in the new cars now being constructed there will be nine." So, it was with the second order of "Baldie" 4000-series cars, #4129-4250, that the current seating arrangement can first be traced to. However, it was the four experimental 5000-series cars that the seating arrangement of the modern elevated cars was cemented. In these units, all seats were transverse, non-reversible, and approximately half faced in each direction. It was stated in CERA Bulletin 73, in an article about the then-new 5000s dated August 1947, that "the fixed seating arrangement is commonly used in subway cars to reduce the turnaround work of trainmen, but the use of only cross-seats is novel." 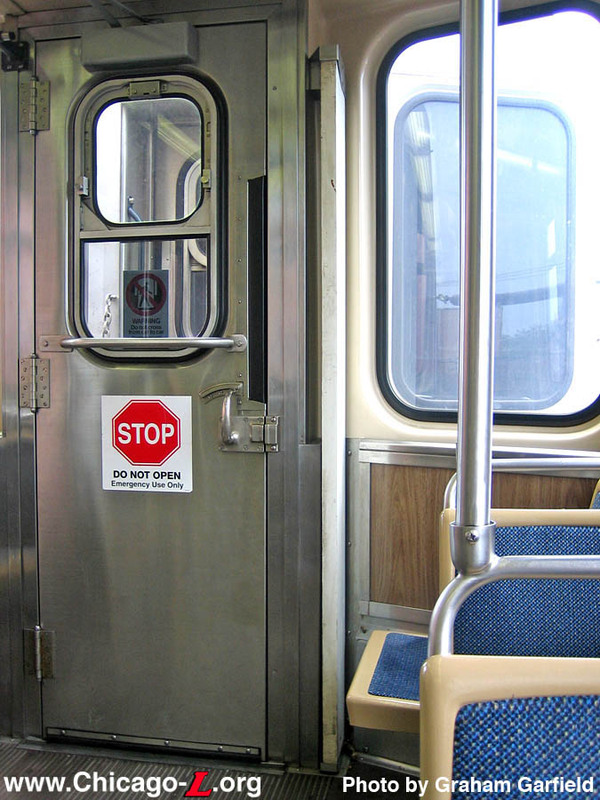 Ever since then, CTA cars have used all transverse fixed seats, with the exception of some seats near the side doors where equipment is housed under the seating, which backs onto the side wall of the car. Why has Chicago stuck largely with transverse seating for the last 50 years? The article from Electric Railway Journal would seem to suggest that Chicagoans preferred it, at least back in the 1920s. In large part, its continued use seems to stem from two things. One is that the "L" has smaller passenger loads, relatively speaking, than many other subways systems like the London Underground and the New York subway. Longitudinal seats provide fewer seats per car, but allow for more standing room (which ultimately allows more people to be packed into a car), making it ideal for busier lines. Many systems have different types of seating arrangements on cars assigned to lines with differing passenger loads. But, in spite of some very heavy loads as rush hour on many lines, including the Red and Brown Lines, it is felt that the "L" doesn't usually have sufficient loads to require all or additional longitudinal seats. The other reason dovetails with why the new 3500-series cars will not continue to trend for including some single seats (as in the 3200s), which was a compromise of sorts for gaining more standee room without using longitudinal seats. Customer surveys conducted by the CTA suggested that while having the singles allowed more standee room at rush hour (and thus can get more people on the trains), it is not perceived by the public that way. They see it as providing less seats, thus lowering a rider's chance of getting a seat. So, on some level the choice of seating arrangements is a situation of the CTA doing something that, although it might not be the most efficient choice, is be perceived by the riders as a better choice. Nevertheless, in mid-2004, the Chicago Transit Authority modified a two-car 3200-series unit with a longitudinal seating arrangement on a test basis to test how additional maximum capacity could be attained with new seating configurations within existing car dimensions. Cars 3407-3408 were given a new interior seating plan with a longitudinal arrangement. To make up for the handgrips that were on the tops of the removed transverse seats, horizontal metal grip bars were installed overhead along each side of the aisle. In addition, vinyl straps were also installed in some places along the overhead stanchion and vertical metal poles were also located between every two seats. The CTA released the cars on Monday, May 17, 2004, first assigning them to the Brown Line before rotating them to a different line after about a week's time and surveying riders to ascertain their feelings, experiences, and preferences. To learn more about these cars, click here. 4.10 Q: What is the current status of the 3500-series car project? When are the 3500s being delivered? Will they merely supplement the fleet or are the 2200s going to be decommissioned? A: The Chicago Transit Authority issued a request for bids for the manufacture and delivery of the 3500-series on April 17, 2002. The request advertises for a contract to manufacture up to 406 cars, with options to build up to 300 additional cars. This is more than the CTA's initial plan for a base order of 250-300 cars, with three additional options for another 100, 150, and 150 more cars per option, respectively. More than likely, it simply represents a combination of the original base of 300 plus the first option for 100 for the approximately 400 cars of the requested base contained in the advertised RFP, with the remaining two 150-car options remaining as supplementals. The final number of cars to be produced will, in the end, depend on several factors, including available funding (the promised Illinois FIRST funding only covered 150 cars) and what sorts of bids the contractors end up submitting. The final decision on car order sizes will not likely be known until after the final bids are submitted on October 15, 2002. The 3500-series cars will essentially be the same as the Morrison-Knudsen 3200-series units, cars 3201-3456, delivered in 1992-94 and which are currently in service on the Orange, Brown, and Yellow Lines. Like the 3200s, the 3500s will be unpainted metal with corrugated side panels on the exterior and will feature full-width motor cabs, air-conditioning upholstered seat inserts, and sliding side doors. However, new features will be added as well. Confirmed features include a video surveillance system (prototypes of which were retrofitted and tested on some 3200-series units) and protective film on windows to deter graffiti vandalism. Other rumored features include improved destination signs, use of 2x2 seating throughout the car (discontinuing the use of single seats started in the 3200s), and the use of AV signs inside in concert with the automated announcements to alert riders to station stops and other information. Confirmation of these and other rumored features will be forthcoming as time goes on and will be known for certain when the CTA decides upon a manufacturing bid submitted by a vendor. The 3500-series car program was stalled, however, when the bids for the cars were canceled as of late December 2002. The RFP was revised, adding "This is your official notification that the subject requisition has been canceled in its entirety." This does not necessarily mean that the 3500s will not be ordered. It just means that the RFP, as it was advertised in 2002, has been canceled. The reason for the cancellation was apparently that CTA brass asked for so many modifications to the design of the cars after they were put out to bid that it ostensibly made the bids based on the old RFP irrelevant. Part of the revisions are changing propulsion from DC to AC traction. For more on these cars, see Question 4.11. The specifications are being revised and the package will be put out for bid again in 2003 or 2004. Sources have indicated to us that Alstom and Bombardier were among the interested bidders on the original RFP. The proposed base order would replace the Budd 2200-series cars delivered in 1969-70 and the Boeing-Vertol 2400-series cars delivered in 1976-78. The additional options, if exercised, would be used for increasing the fleet size to meet growing ridership and to equip new lines and extensions (should any be in operation by the time of their delivery), or perhaps even begin to replace some early 2600-series cars, depending on how long it is before the options are exercised. The cancellation of the original RFP at the beginning of 2003 will have some serious repercussions on the system and its current rolling stock, however. This delay means that CTA won't get a new car on the property until 2009. Thus, the 2200s might reach forty before they are retired. The last cars to reach 40 years of age before retirement were the 4000s, though some 6000 and 1-50 series cars came close. Combine this with the fact that any route extensions, 8-car trains on the Brown Line (projected for 2008), or any other additional service on the existing system will require more rolling stock, plus the fact that CTA will likely begin sending 40 or so 3200-series cars at a time off the property for their mid-life rehab in about 2005 or so, and CTA could be looking at some real car shortages in the next five years due to the delay in the 5000s (the new designation for the 3500s). 4.11 Q: What is the current status of the AC-propulsion car project? When are these cars being delivered? A: In May 2003, the CTA publicly announced that their plans to purchase new rail cars, for which an RFP that had already been issued was pulled off the street in December 2003 (see Question 4.10), was delayed because of their decision to start buying trains with alternating current (AC) technology, which is increasingly used in transit system traction. This represented a substantial change from the previous designs, which had called for another order of DC-propulsion units. The conversion will come incrementally as rail cars are replaced and start with the next car order, projected for sometime in 2004. The CTA plans to eventually buy more than 700 new rail cars to replace the aging Budd 2200-series cars delivered in 1969-70 and the Boeing-Vertol 2400-series cars delivered in 1976-78, as well as to expand the fleet size for various expansion plans. The decision to convert the fleet to AC traction is based on both passenger comfort and cost savings. AC cars have practical benefits for riders. AC train motor systems produce smoother acceleration and braking, eliminating the jerky startups, the neck-swaying decelerations, the noise and the bumpiness that have always been hallmarks of riding CTA trains. Trains also use AC power more efficiently, lowering operating and maintenance costs, and there is less wear and tear on the rails and cars because of the way the power is supplied. Being the only transit agency left in the country that operates a DC propulsion fleet raises costs significantly because it means the suppliers of DC cars and components are more and more restricted as time passes. Even with these benefits, the changeover is no small feat. The third rail will remain 600v DC through the end of the conversion to AC power. The DC-to-AC conversion will happen on the cars. However, this still means that there will be a long period during which CTA will operate a mixed fleet of AC and DC equipment because the conversion will take decades, the amount of time needed to replace the agency's entire fleet of railcars. (The newest of the current cars, the 3200-series cars, aren't projected to be retired until the late 2010s at the earliest, more likely in the 2020s.) A line, theoretically, will be able run with both AC and DC equipment during the conversion period. However, CTA has indicated that the switch to AC generation will probably be made one rail line at a time, perhaps beginning with the Brown Line when its $529 million reconstruction, set to start next year, is completed in 2008. "We are thinking the conversion will take four to five years, but it could be longer depending on the market," said Dennis Anosike, CTA treasurer and vice president of finance, in November 2003. These cars will then require a minimum of approximately 6-8 months of testing around the system before they can go into full production. It will be 2009-10 before cars start arriving at a significant rate. The conversion to AC power will require the CTA to make changes in signal and communications systems to accommodate the 706 rail cars that will be purchased. The new cars will keep the same coupler (the Ohio Brass Form 5), so the ACs and DCs can be mechanically coupled (good news if one type needs to push a dead train of the other type in an emergency), but they will not be able to be electrically coupled. This means that cars the work equipment fleet will only be compatible with one set of cars or the other. On the series naming front, it had been previously assumed that the next group will be numbered in the 3500-series (the same as the series that was canceled when the decision was made to go to AC power; see Question 4.10). However, the CTA decided that the cars would not be given car numbers that are not sequential with the current fleet, beginning far above the current numbers, to separate them from the old DC fleet. This move would be consistent with CTA's previous breaks from older technology, such as the progression from the PCC 6000-series cars to the High-Performance Family 2000-series cars in 1964. The cars have been designated the 5000-series, the second car series to bear this designation following the PCC cars that were in use from 1947 to 1985. 4.12 Q: Why are there extra destination signs on the train roller curtains -- i.e. "Roosevelt" and "Wilson" for the Red Line, "Rosemont" for the Blue Line, etc. -- that are not needed for everyday service? What are these readings for? A: The extra signs are for "short-turns", runs that end and turn around before they reach the end of the line. Some of the "extra" signs are actually used regularly in scheduled revenue service. For instance, on the Brown Line, late at night and early in the morning the service is truncated to a Kimball-Belmont shuttle, so the "Belmont" destination sign is used in that regular service. There were also one or two runs that short-turned from south to north at UIC-Halsted and used the "UIC-Halsted" sign. Some of the extra signs are used only in emergencies and special occasions. These -- such as "Roosevelt" and "Wilson" (Red), "Loop" (Green), etc. -- are kept on "just in case". 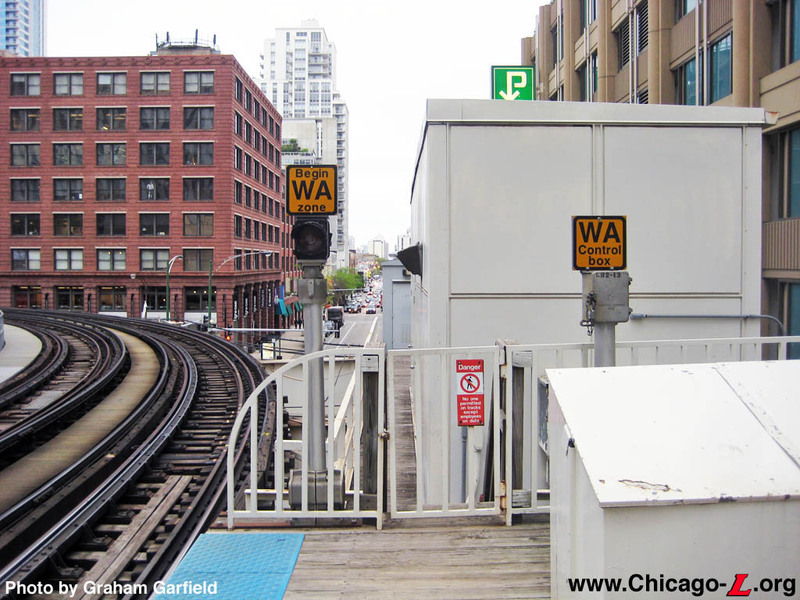 The locations that are chosen for the signs are determined by logical and pragmatic places the CTA uses to turn trains. Roosevelt/State, for instance, is often used in 2004-06 during Dan Ryan branch reconstruction when CTA sometimes needs to lighten up the headways on the Ryan due to construction and single tracks, and the location is logical because it's south of downtown and the interlockings at 13th and 15th streets provide nice places to turn a train. UIC-Halsted is good because the Morgan Middle Track, west of the station, provides an "out of the way" turnaround place. Some signs are also because of mid-line yards, where CTA might sometimes take a train out of service at the yard and lay it up, but this happens before the end of the line. "Rosemont" is such a sign and location. "Wilson" was also the same way, except that the sign is now superfluous because the yard burned and was removed in 1996. Today, the CTA would be very, very unlikely to ever short-turn a train there except in an emergency. And then there is the infamous "Ford City" Orange Line curtain, a reading for a destination the CTA doesn't even go. Why does this exist? Because the Orange Line was originally planned to reach this mall at 75th and Cicero, a mile south of the current terminal. Although the line was already open and truncated at Midway when the current curtains were made, it was kept on perhaps in anticipation of the line eventually reaching its ultimate destination. 4.13 Q: What is the purpose of the wooden board to the right of the #2 end doors inside "L" cars? A: The board is a "gang plank" used to evacuate a train in certain situations, specifically when a train is outside of a station and there is another train along side the train being evacuated. In this scenario, the operator of the train being evacuated coordinates with the operator of another train to stop their train with a side door on their train lined up directly opposite a side door on the other train, taking into account the distance between adjacent tracks, differences in elevation, curved track, et cetera. The operators of both trains then request power off in all directions, open the side doors that were lined up, and place a minimum of two gang planks next to each other, anti-skid side up, between the side doors. They announce that the train is being evacuated to another train, give specific instructions, and the operators of both trains assist the passengers in crossing between the cars on the planks, guarding the unused portion of the door openings. After the train is evacuated, the operator returns the gang planks to their stored position in the #2 end of the car. The rehabilitated 2600-series cars have a gang plank held in a bracket on the right side of the end door at the #2 (non-cab) end of even-numbered cars in each pair, while the odd-numbered car in each pair have the plank in this location plus a short ladder secured in a locked cabinet. All other contemporary "L" cars -- those in the 2200-, 2400- and 3200-series -- only have planks, with one in each car in a bracket on the right side of the #2 end door. 5.1 Q: What is the "A/B skip stop" system? A: When the CTA took over in 1947, the "L" was a tangled series of complex schedules involving multiple express and local services, often running over the same tracks and getting in each others' way. The system needed to be streamlined and after much study, a "skip stop" express system was devised. Under this system, the less-used stations were alternately designated A or B stations. Heavy-use All Stop stations were placed throughout the system as well. Trains were designated A or B trains and would only stop at their respective letter stations, as well as the All Stop stations. This way, neither type of train would catch up with the one before it and the headway at All Stop stations would be relatively consistent. For a detailed description of A/B skip-stop service, see our page on the operation's history. 5.2 Q: I remember the "L" having conductors. What happened to them? A: CTA trains no longer use conductors. They began to be phased out in 1993, with the arrival of the Morrison-Knudsen 3200-series cars, which were designed for one-person operation. (The key to one-person operation is the full-width cab, which allows the motorman to operate the doors of and look out the window on the left side of the train. Pre-3200-series cars don't have these.) These cars were assigned to the Skokie (Yellow), Ravenswood (Brown) and Midway (Orange) Lines. The other cars have had a yellow cloth strap installed in the front, blocking off the front seat, making the front of the car a dedicated crew area. The Orange Line operated without conductors since its opening 1993. The Ravenswood switched over in 1995, the Lake-Englewood-Jackson Park and Evanston Lines in June 1997 and the Howard-Dan Ryan and O'Hare-Congress-Douglas on November 9, 1997. The Skokie Swift has operated with one person since it began in 1964. Under this system, motorman (renamed "operators") pick up the additional duties of performing platform safety checks, opening and closing train doors, making station announcements, answering passenger questions and sometimes positioning portable ramps for wheelchair-bound passengers. The reshuffling of duties added to travel time (though the increase has been greatly cut down over time, it hasn't completely disappeared), rider and employee aggravation and, some say, the chance of safety problems. Still, the CTA says they will be able to save over $13.8 million in 1998 and that this is the standard the transit industry is adopting. Conductors continued to be used for safety reasons on the subway portions of the Red and Blue Lines for some time after their removal from the rest of the system. On the Red Line, the conductor would board the train at Fullerton and ride south, making announcements and operating the doors, until Cermak-Chinatown. There, the conductor would board a train northbound and repeat the same. On the Blue Line, conductors boarded and Division and alighted at Clinton on Forest Park/Cermak runs and vice versa on O'Hare runs. Red Line subway conductors were used seven days a week; Blue Line conductors were not used on the weekends. Installation of safety mirrors and monitors, as well as the inauguration of the automated voice announcement system allowed these conductors to be removed on Saturday March 25, 2000, ending an era in "L" history. 5.3 Q: Was Chicago's elevated system ever used for any kind of freight service? A: Yes. When the Northwestern "L" was extended north from Wilson to Evanston in 1908, it was done so over the grade-level tracks of the Chicago Milwaukee & St. Paul Railroad, who carried both passengers and freight. The CM&StP diverged from the "L" at Wilson and their right-of-way went south along its own route to Union Station. Until the North Side "L" north of Wilson was elevated in the 1910s and early 1920s, the St. Paul had their own freight track. The elevation eliminated that track and thereafter freight service became the responsibility of the "L" . The Northwestern Elevated bought two steeplecab locomotives, S-104 and S-105, in August 1920 to run the service. They were both originally lettered for the "Northwestern Elevated Railroad Company", changed to "Chicago Rapid Transit Company" after the 1924 consolidation of the elevateds. The continued into CTA days, painted over in the standard utilitarian work-car yellow, but always retaining their original car numbers. The split and the paralleling track (or remnants of it, at least) can still be seen between Wilson and Montrose. Freight was run on Track 1 (the west-most track, today used by Loop-bound Evanston Expresses), the locomotives running off overhead trolley wire. There were industries along the North Side mainline, and on the Evanston branch to be served initially. The last customer was around Berwyn on the North Side main. The CRT used the locomotives for work trains at times, as well. Some of the sawed-off trolley poles can still be seen along the west side of the embankment, now carrying electrical cables. The CTA stopped running freight in 1973. For a detailed history and description of freight operations on the "L", see the Freight Service on the "L" section. 5.4 Q: What's the history of the Part-Time stations? When did it happen, and which stations were originally made part-time? Are any of them going to be made full time again? A: See answer to question 2.4. 5.5 Q: I've always wondered about having to go all the way to 51st to transfer between the Englewood and Jackson Park branches. (58th was an A station and Garfield was a B station.) Wouldn't it have made more sense to allow people to transfer at 58th, with its closer location and easily-crossable island platform? A: See answer to question 2.7. 5.6 Q: At most stations, a portion of the platform has a yellow stripe painted along edge, usually toward the middle and about 10 feet long. It can't be a warning line to keep back from the edge, since it doesn't run the length of the platform. What does this line mean? A: See answer to question 2.8. 5.7 Q: When a train takes the wrong route at a junction, how does that happen? Isn't the route preprogrammed or does the operator choose his/her route themselves? A: How it is that a train can take the wrong "line-up" -- a particular alignment at a junction leading to a route -- depends somewhat on what junction it is and how the junction is controlled. In the case of 59th Junction (where the Green Line branches on the South Side) and Loomis Junction (where the Blue Line splits on the Near West Side), the junctions are set automatically to sort every other train to each branch. Generally, the only way a train can be incorrectly routed is if two trains destined for the same branch arrive consecutively (such as two Forest Park branch trains in a row), perhaps because a trip (say, to 54/Cermak) was annulled. In this case, the operator would need to stop at the wayside route selector before the switch and manually set his route; failure to do so would send him onto the wrong branch. In the case of very busy locations with irregular train movements, such as Tower 18 (the northwest corner of the Loop at Lake/Wells), Clark Junction (where the Red/Purple and Brown lines split on the North Side), and Howard Yard (were Red Line train must turn around and Purple and Yellow lines trains must be routed through the yard to their respective routes), the switches are aligned by towermen. Responsibility to set a correct line-up is typically the towermen's. An unusual location, and one where incidences of operators taking incorrect line-ups is most common (relatively speaking, of course; in the bigger picture, it happens fairly rarely), is Tower 12 (the southeast corner of the Loop at Wabash/Van Buren). During midday and off-peak hours, Tower 12 is set for automatic operation. The default setting is for Green Line trains to operate north-south along Wabash, while Brown Line trains are routed around the Outer Loop upon being detected approaching the junction. Inbound Orange Line trains are sorted from northbound Green Line trains and sent onto the Inner Loop by a transponder attached to each Orange Line car, which transmits its presence to a receiver at Roosevelt station and aligns the switches properly. But when the Purple Line Express is running, a towerman is assigned to Tower 12 to sort Purple Line trains from southbound Green Line trains. The towerman is present during most of the Purple Line's hours on the Loop, but for a few trips they are not. The operators of these trips must manually choose their route by stopping at the wayside route selector, canceling the proposed routing and selecting the right one. Failure to do so will send the train onto the South Side Elevated rather than around the Inner Loop. In responding to a similar question in Jon Hilkevitch's Getting Around column in the Chicago Tribune on August 2, 2004, CTA Vice President of Rail Operations Jack Hruby pointed out that the train operator is responsible for checking to ensure that the track lineup is correct for the route regardless of what type of junction it is or if a towerman is present. In the end, they are responsible for visually verifying the switches in front of them are properly aligned before proceeding through the junction. 5.8 Q: Why is it that sometimes when a train pulls in to a station, it will stop before it is fully into the station, then start up again and complete its arrival into the station? It always confuses passengers as people run to where it stopped short, only to have it move again. A: The short explanation is that the train gets a red signal before it's fully berthed into the station, requiring it to stop. Once it has come to a full stop, it can then fully berth into the station. There are a handful of reasons why the train will have received a red/stop indication on its Aspect Display Unit (ADU), the box inside the motorcab that relays signal and allowable speed information to the train operator, part-way into a station. Most of the time, it is because there is either a train a short distance ahead or the break (or "bond") between track circuits (or "signal blocks", in older technology parlance) is in the middle of the platform and there is a train occupying the next track circuit. In the case of the latter, you might not see a train directly ahead, but no two trains are supposed to occupy the same track circuit and if the one ahead reads "occupied", the train will receive a red signal instructing the operator to stop and wait for the track ahead to clear. You may notice that the phenomenon of trains stopping part-way into the station is more common during rush hour. This is because there are so many more trains operating during the peak hours, and thus there is a greater chance that trains will get close to one another, causing the situation explained above. Normally, when an operator receives a red indication on his ADU, he must stop and wait for the train ahead to move and to receive a proceed indication (yellow or green) on his ADU (unless the reading appears to be in error; then he must call Control for instructions). However, there is an exception to this rule which states that if the train is stopped by the cab signal when it is partially into a station, the operator may move the train at restricted speed (6 mph) or less to its proper berth in the station when it is safe to do so (i.e. the operator has visually verified that there is no train between him and the end of the platform). But in order to move against the red signal in accordance with this rule stipulation, the train must first come to a full stop. Then it can proceed as stated above. This rule exception exists is because a) having the train partially into the station confuses people, as the question points out; and 2) passengers often start getting impatient and pulling the emergency door release levers inside the train, opening the doors which are on the platform. This creates a dangerous situation for the passengers (it is never a good idea to pull the emergency door release, unless it's a real emergency) and also causes the train to lose its door relay, cutting off power to the motors and further delaying the train's ability to properly berth. 5.9 Q: Did the "L" have 24-hour service when it first opened? When did various lines lose overnight "owl" service? A: When the first "L" line -- the main line of the Chicago & South Side Rapid Transit, between Congress and 39th Street -- opened in 1892, it had 24-hour service. During overnight hours (12 midnight to 5am), trains ran every 20 minutes, as opposed to every 2-1/2 minutes during rush periods and every 5-10 minutes other times. As the three other private "L" companies opened between 1893 and 1900, and subsequently expanded their lines, they too provided 24-hour service. While all the "L" lines operated 24-hours a day, not all services ran at all times. Most lines, especially trunk lines, ran a combination of different services over the same tracks, including various combination of local and express services, as well as routes that served various branch lines. All of these services did not necessarily run 24-hours; many services were only operated during daytimes hours or rush periods. Generally, only local services were operated overnight, making all stops along the line. Service on some branches was restricted to shuttling along the branch and connecting to main line local trains for continuing trips rather than running through-services to downtown or crosstown. Still, with the exception of some of the stub terminals just outside of downtown used for rush-hour overflow, all stations generally had some service overnight, even if it was only local trains or shuttles. This continued through the various mergers of "L" companies and reorganizations of service, even to lightly-used lines, branches and stations. Some of this service may have been obligatory, required by ordinance or franchise. Abandoning overnight service probably would have required permission from the Illinois Commerce Commission (and, for companies in receivership, the bankruptcy court), which would have had little chance of success given the political climate. On the other hand, even with things they could directly control, the private "L" companies were often slow to respond to changing markets and ridership trends, and often kept low-use stations and services in place out of need to compete with other private transit companies (streetcars, and later buses). This continued until the transit companies were merged and were taken over by CTA in 1947. The CTA was required to cover its operating costs through farebox and other revenues, but was also empowered to set its own fares and service levels to meet this obligation and match service levels to ridership demands. The CTA didn't begin to prune overnight service right away, however -- the service reorganizations on the Lake Street Line in 1948 and North-South Route, Ravenswood Line and Evanston service in 1949, designed to economize and make those lines faster and more efficient, generally left overnight service intact (see exception below). This, however, was short-lived, as CTA began to curtail overnight service soon after. As CTA continued to study and analyze "L" services, some overnight "owl" service (as it has long been called in Chicago) began to be trimmed. Initially, these reductions tended to be targeted to short branches with very, very light ridership. In some cases, since CTA now controlled the surface division as well, it was felt that buses or streetcars provided a more economical option for the light overnight ridership on these lines (usually on existing routes, not new services substituting for the owl "L" service). This is a chronological listing of when owl services were discontinued on the "L". Not listed are cases where all services on a line were discontinued at once (e.g. the whole service was annulled), including owl service, or services which began operation without owl service such as the Skokie Swift (Yellow Line) and Orange Line. 1949 July 31: Ravenswood Line, owl service discontinued Armitage to Loop (continues to operate Kimball to Armitage). 1950 Jan 1: Normal Park branch owl service discontinued. 1950 Feb 19: Humboldt Park branch owl service discontinued. Owl service discontinued on Westchester branch branch between 22nd/Mannheim and Roosevelt (section reduced to Mon-Sat rush hour shuttle only). 1961 Oct 29: Ravenswood owl service cut back to run Kimball-Belmont only. 1976 Sept 12: Remaining Ravenswood owl service discontinued. 1998 Apr 26: Cermak (Douglas) branch, Purple Line (Evanston), and Green Line (Lake-Ashland-East 63rd) owl service discontinued. At present, only the Red Line (Howard-95th) and Blue Line (O'Hare-Forest Park) operate 24 hours a day, with owl service overnight. 6.1 Q: Did the Kenwood and Stockyards branches run over streets or alleys and are there any remnants left? A: These branches ran over their own right-of-way for most or all of their own lengths. The Kenwood actually ran in the ROW of the Chicago Junction Railway, who ran freight from the Illinois Central Railroad along the lake shore to the Stock Yards; they ran side-by-side on a solid fill embankment that roughly paralleled 40th Street. The Stock Yards likewise mostly ran over a private right-of-way, except in the Stock Yards, where it did run over "streets". I say "streets" in quotes because they could barely be called streets; there were livestock roaming in them and they were barely passable by vehicles. There are really no good remnants left: a few rusty poles here and there along the Stock Yards route, but I hear some of the embankment of the Kenwood still exists. I have yet to personally investigate it, though. 6.2 Q: I've noticed that in the Dearborn Subway on the Blue Line, there appears to be a short spur, apparently heading to the west, between the Grand/Milwaukee and Clark/Lake stops. The spur appears to be fairly short and does contain tracks. What this might be for? A: When Chicago's first subways were designed in the late 1930s, a number of extensions were planned to be built at a later stage. In some cases, the way the initial system of subways (e.g. the State Street and Milwaukee-Dearborn subways) were constructed included features to make these extensions easier. One type of this provision was the construction of junctions for as-yet-unbuilt branches. One of the branches off the subway that was planned for but never built was a connection between the Lake Street "L" and the Milwaukee-Dearborn Subway. It was planned to reroute at least some Lake Street trains into the Dearborn Subway. Exactly where the Lake Street trains would have gone will be discussed in a moment. The split in the tunnel was constructed, it just doesn't go anywhere beyond a few hundred yards west. It is actually a very well constructed junction because the westbound "Lake" track never crosses the tracks of the southbound Blue Line; it is what is called a "flying junction". The eastbound "Lake" tunnel simply merges into the south/eastbound Blue Line tunnel. But traveling west from Clark/Lake, the tunnel splits at about Canal Street. The west/northbound Blue Line tunnel veers northwest, but the westbound "Lake" tunnel continues straight and dips underneath the south/eastbound Blue Line tube, then rejoins the eastbound "Lake" tunnel a few feet west of the junction. The empty tunnels end at bulkheads: the eastbound tunnels ends in the center of Lake Street near the west curb of Canal Street and westbound end 80 feet further north, 100 feet further west and 20 feet lower. A similar arrangement was built into the State Street Subway south of Roosevelt station. As built, North-South trains ascended to the surface after Roosevelt through the 13th Street Portal and went onto the old Englewood-Jackson Park South Side tracks. But there was a plan for an Archer Avenue Subway, so a junction was built at 13th/State where a set of tunnels continued south under State Street beyond the junction for a few hundred feet, then stopped. The Archer Avenue Subway never got built (though the idea was basically executed as the Orange Line in 1993), but the tunnel was put to use in 1992 when a connection was built with the Dan Ryan Line at 18th Street. So, where would the Lake Street trains have gone when routed into the Dearborn Subway? There were several plans over the years for how to use these spur tunnels. A booklet issued in 1943 by the city's Department of Subways and Superhighways when the first subway opened shows a proposed subway in Lake Street to about Racine Avenue. It is unclear exactly where the Lake Street trains would have gone, although it seems that they would have been routed downtown via the subway and then back to the West Side out either the Garfield or Douglas lines. By 1946, the ideas for how to use this subway -- which was not actually finished or opened yet, since construction of the Dearborn Subway had been halted during World War II and would not open until 1951 -- had further developed into more specific proposals. A sketch by the chief engineer of the Chicago Rapid Transit Company proposing train routings portrays the link from Milwaukee Avenue to the Lake Street "L" as a "future subway." In this plan, one-third of the Lake Street trains would have continued around the Loop Elevated and two-thirds would have been diverted to the Congress Street subway. The plan also proposed a connection between the Congress line and the Lake line along the Chicago & North Western Railroad near Western Avenue "instead of Kedzie or west thereof" to return trains back onto the Lake line, the first time such a connection was proposed. Subsequent plans included variations on these proposals. When the Dearborn Subway finally opened in 1951, the Department of Subways and Superhighways booklet for the opening proposed subway extensions from Lake/Milwaukee to the Congress line portal near Halsted Street, as well as the aforementioned connection in or parallel to Kedzie Avenue between Lake and Congress. The extensions were to be built "as early as international conditions and financing problems will permit." The last serious proposal to use the spurs was in the Chicago Central Area Transit Plan proposed by the city Department of Development and Planning in 1968. The plan, which proposed a new Loop subway to replace the elevated along with subways under Franklin and Monroe, would have used the Lake/Milwaukee junction for a nonrevenue connection to a Randolph Street subway which would have connected the Lake Street "L" with the new Loop subway. This plan, of course, never came to be and no plans since then have proposed use the spurs, which remain dormant under the street. 7.1 Q: Is the restoration of the two unused tracks on the Brown Line between Armitage and Chicago part of the proposed $300 million Ravenswood renovation in the Illinois FIRST bill? A: Restoration of these tracks is not part of the Ravenswood upgrade included in the Illinois FIRST plan, only platform lengthenings and some station house reconstruction. Restoring them would only allow express trains to skip one stop -- Sedgwick -- so there is no real benefit to returning these tracks to service. 7.2 Q: What is the current status of the 3500-series car project? When are the 3500s being delivered? Will they merely supplement the fleet or are the 2200s going to be decommissioned? A: See answer to question 4.6. 8.1 Q: When did Chicago-L.org start? A: The site was launched in September 1997 as a small site dealing with "L" stations. Within a year, it grew to encompass other aspects of the "L" as well. 8.2 Q: Why was Chicago-L.org started? A: Chicago-L.org was started largely out of a personal interest in the "L" and its history, and a desire to see an online resource for information on "L" history, which was largely lacking at the time the site as launched.